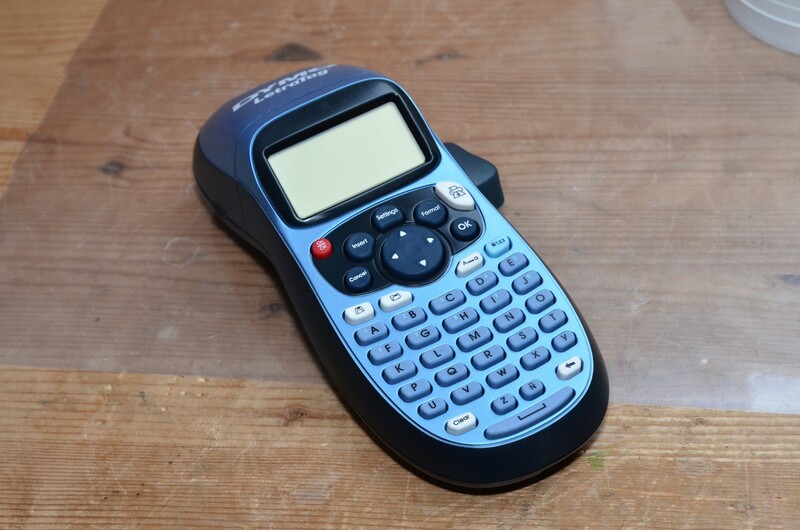 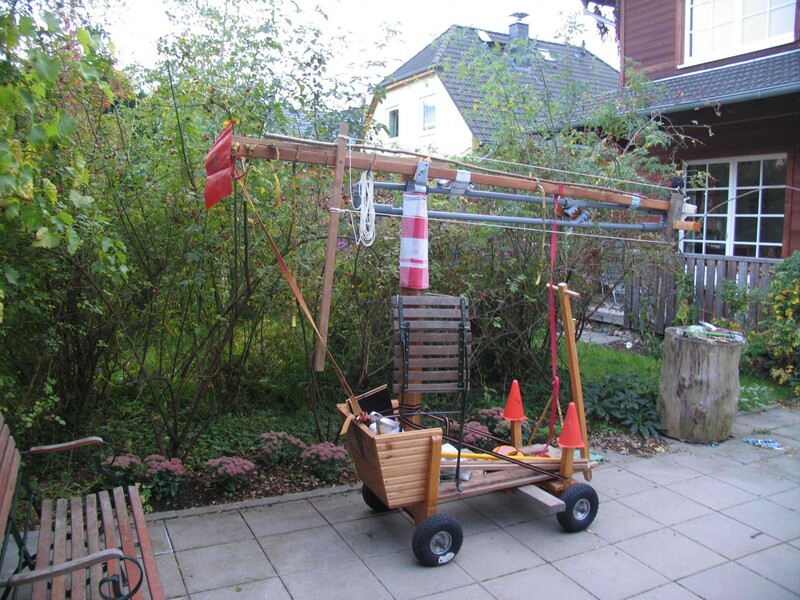 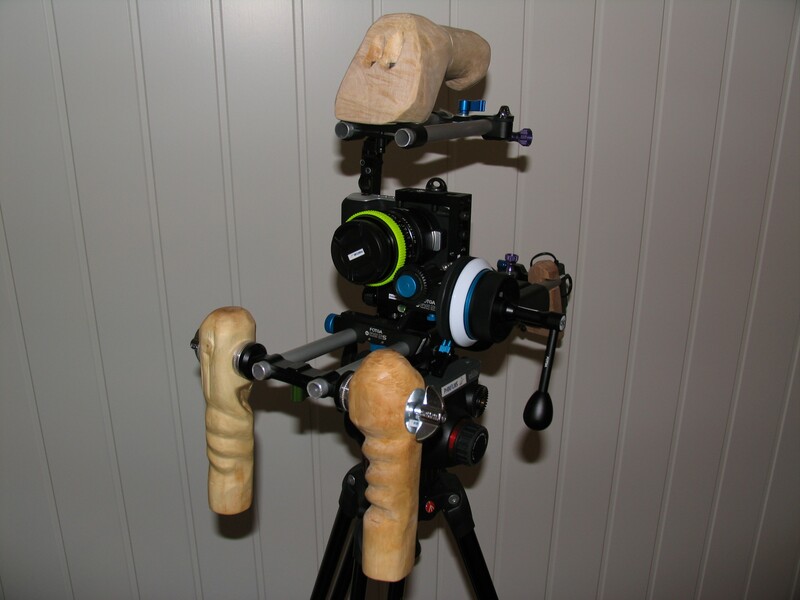 Dies ist die englische Version der Equipment-Seite. 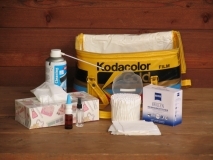 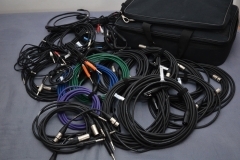 This (english) version of the equipment-page is quite outdated. 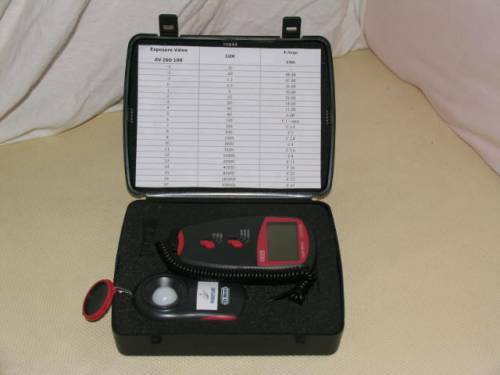 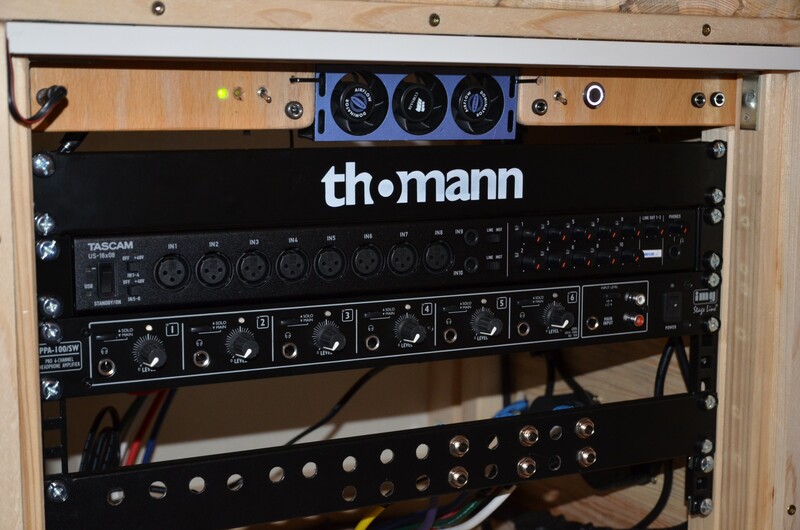 We're working hard on publishing a new translated page, until then you can view the 2016 version in english here; for an (more or less) up-to-date version of the equipment page, please refer to the german version. 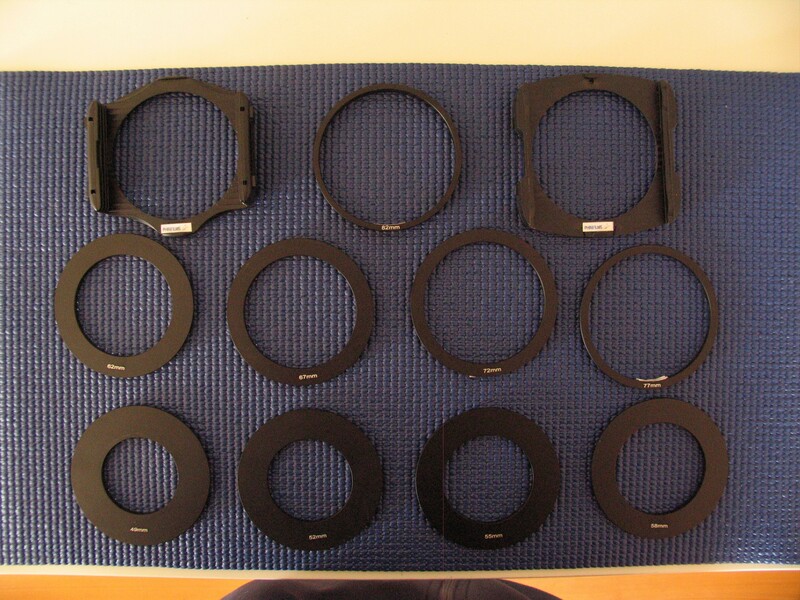 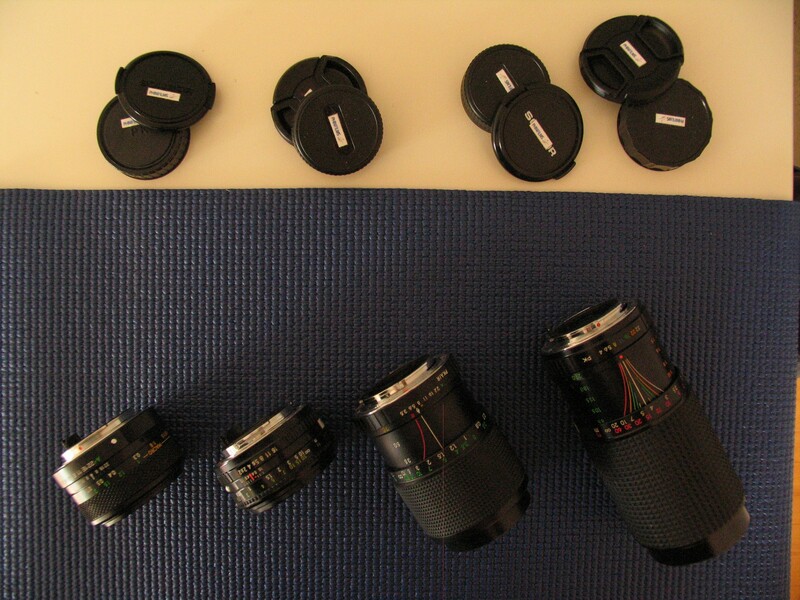 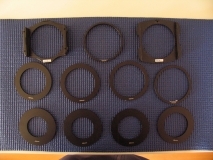 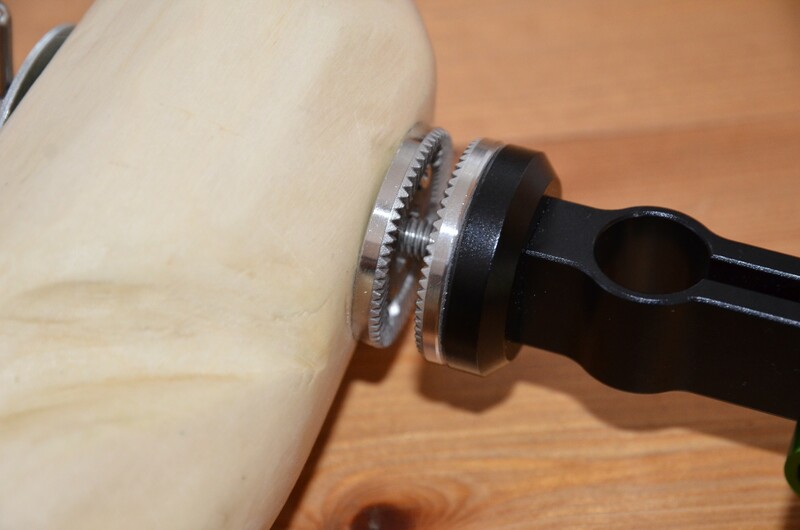 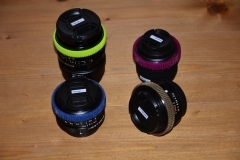 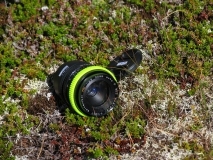 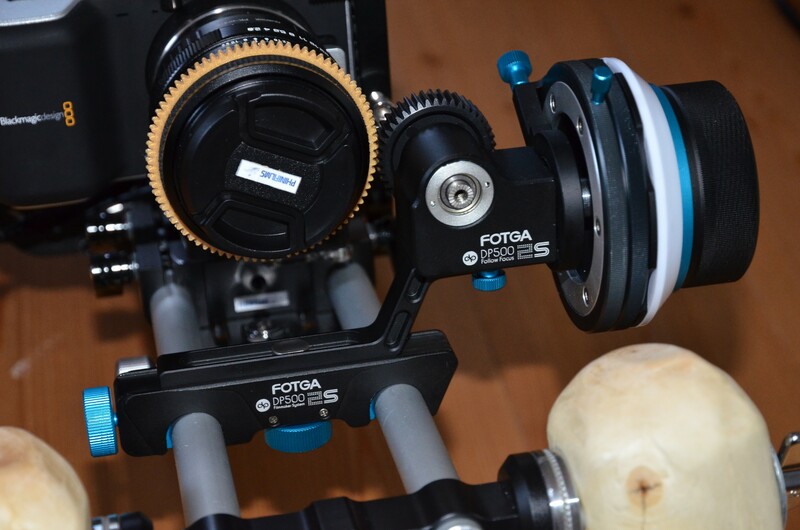 Currently I am adding follow focus gears to all my lenses, which are custom made for me by A. Jungierek. Huge thanks to him! 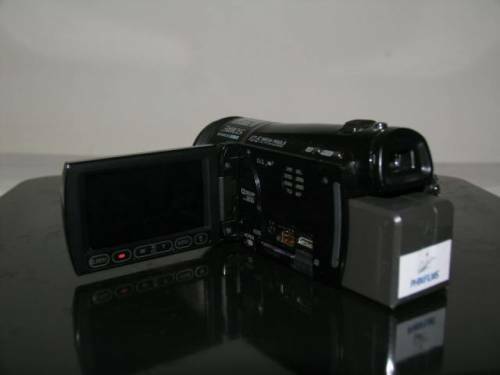 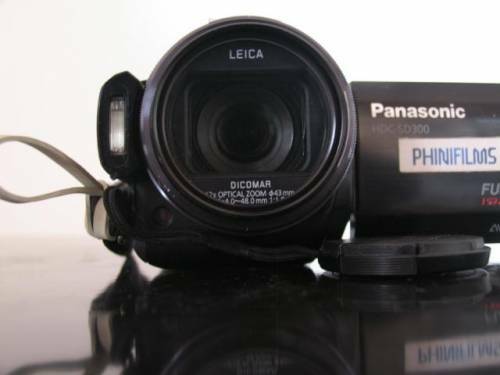 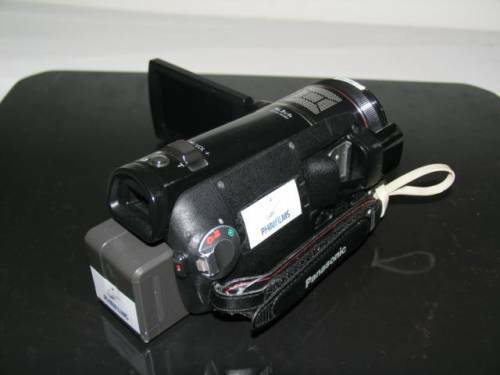 My camcorder is a HDC-SD300 E-GK from Panasonic. 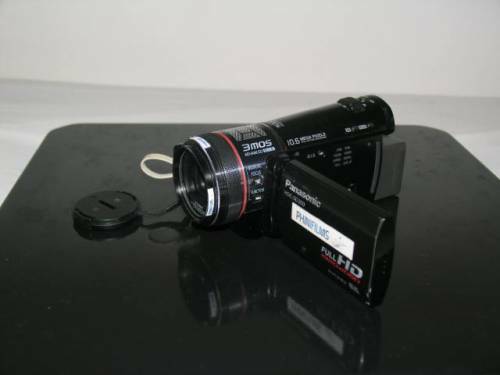 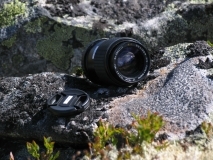 For photography I have a Canon PowerShot Pro1. 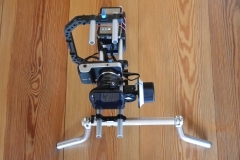 A Rig made from different components, which works great and hasn&apos;t cost much. 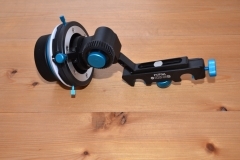 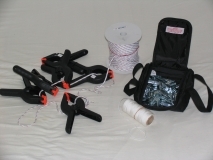 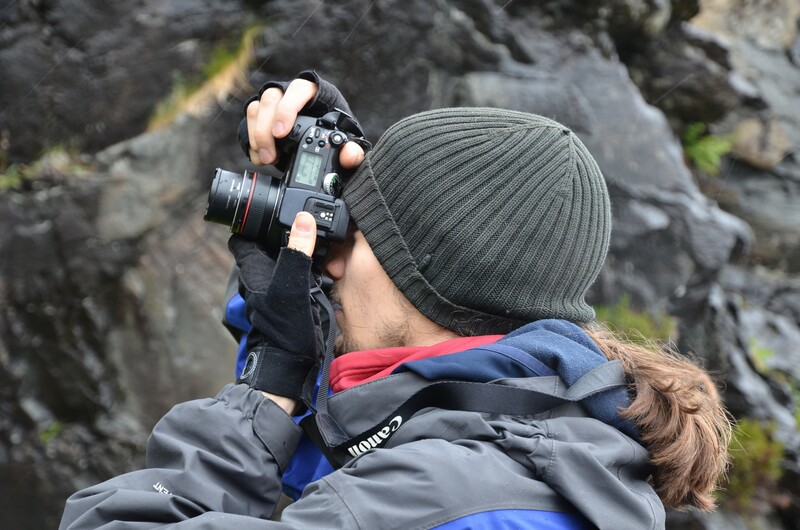 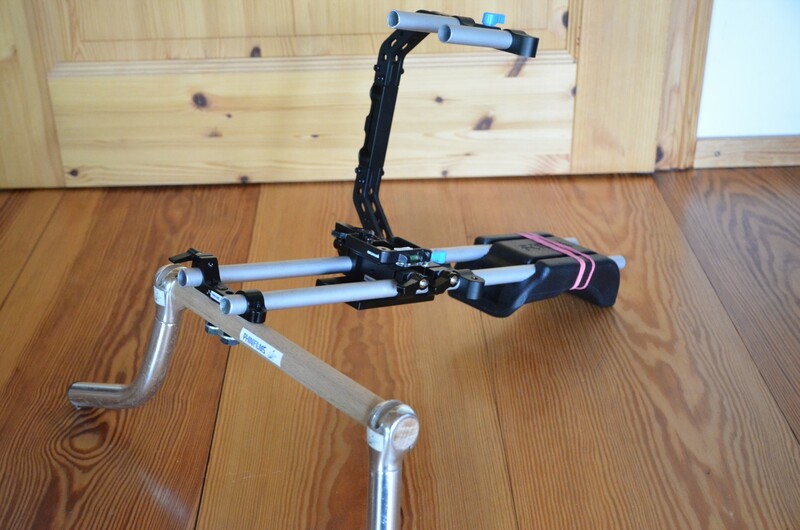 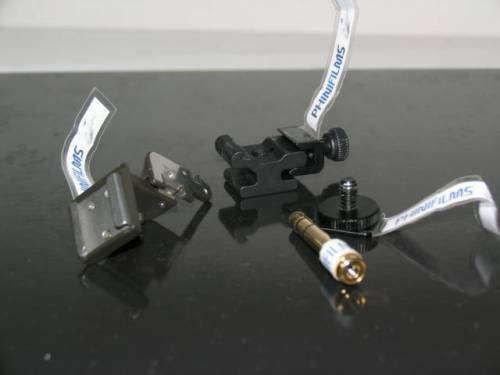 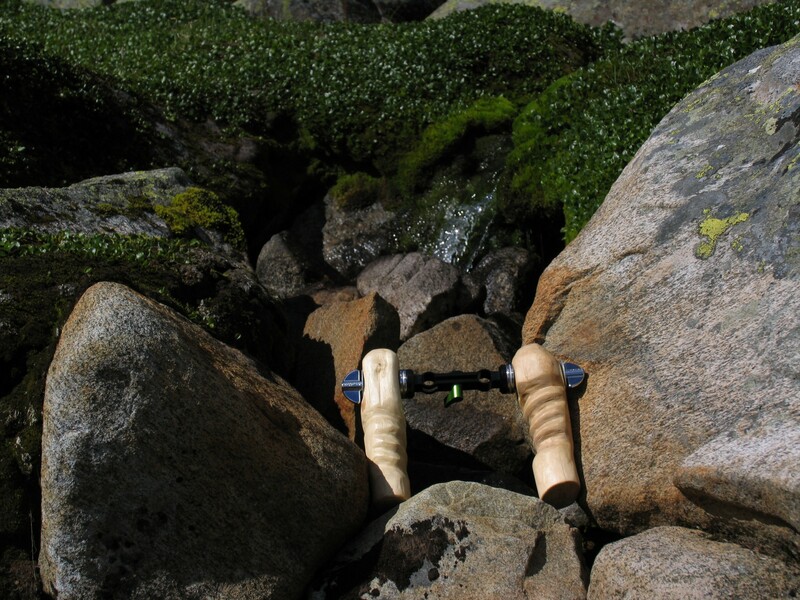 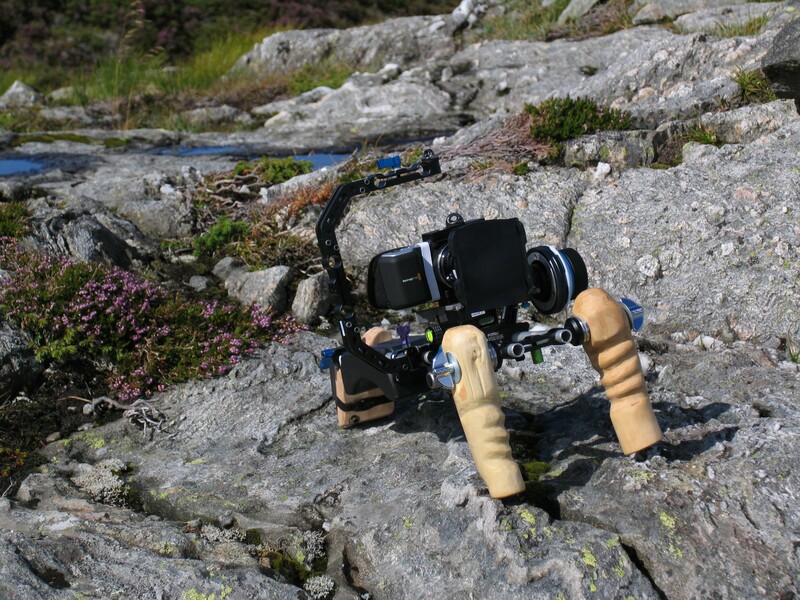 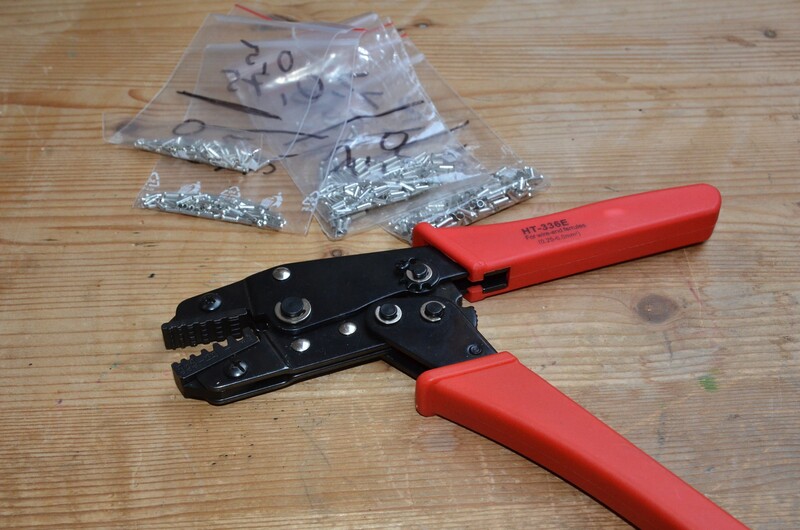 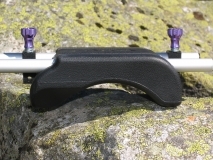 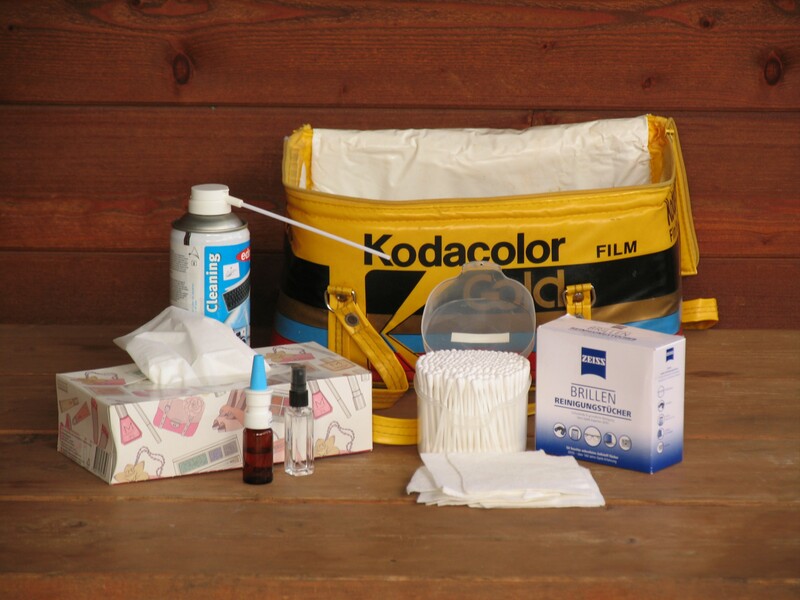 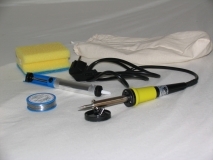 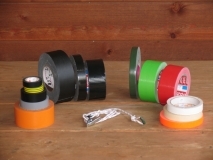 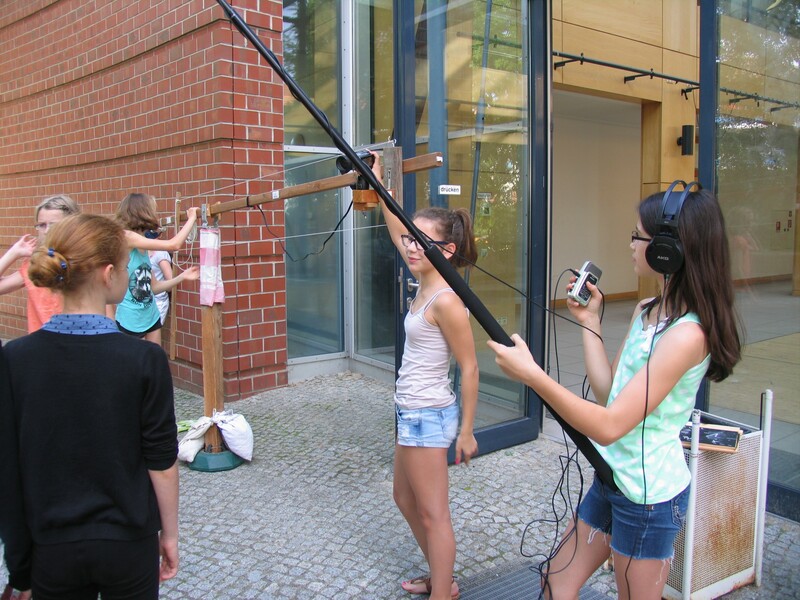 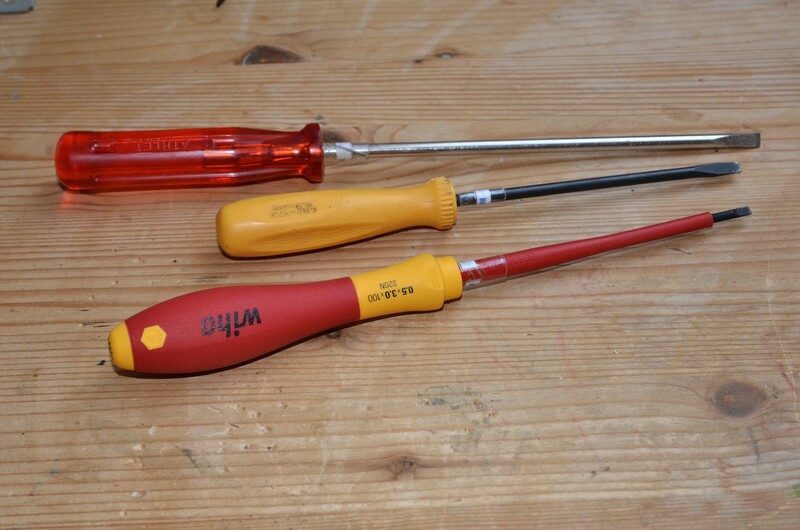 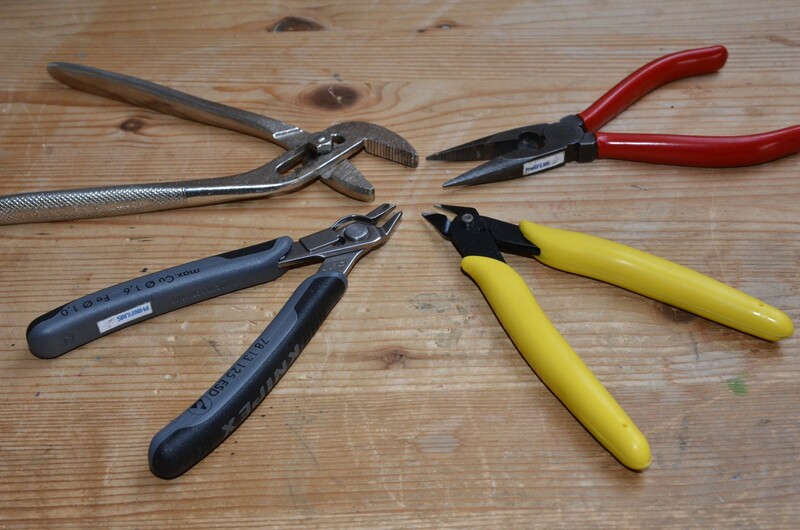 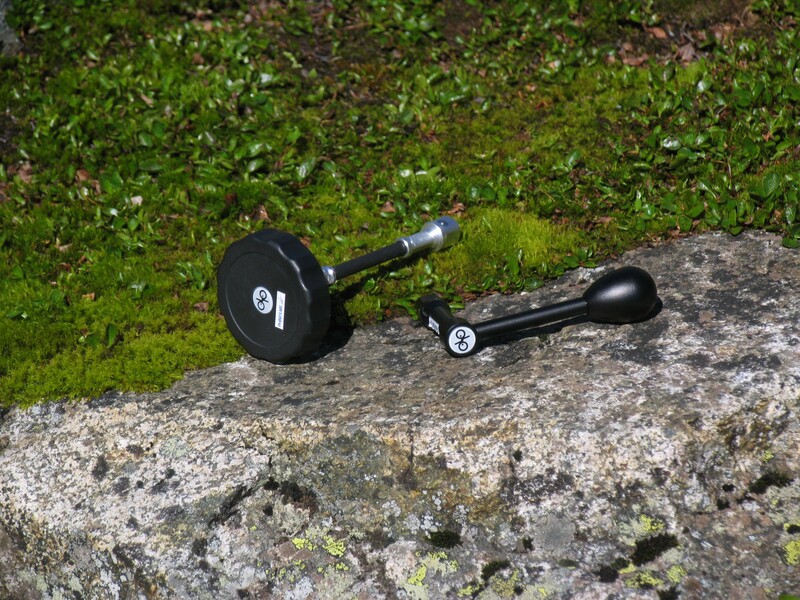 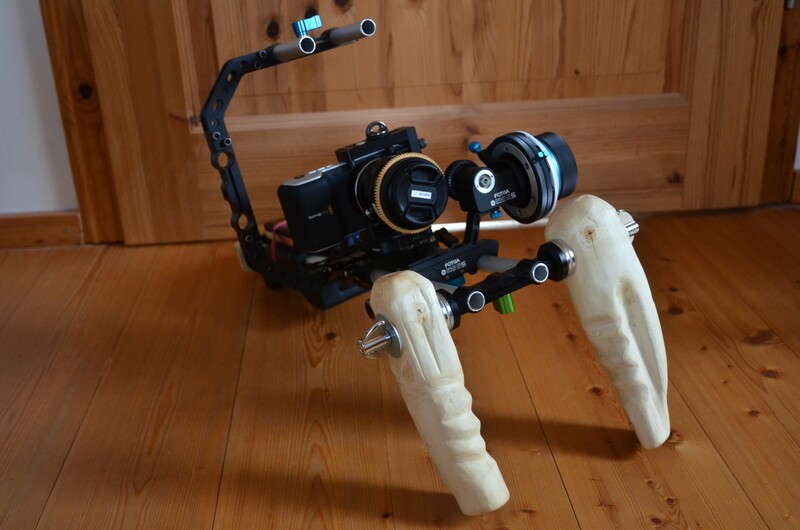 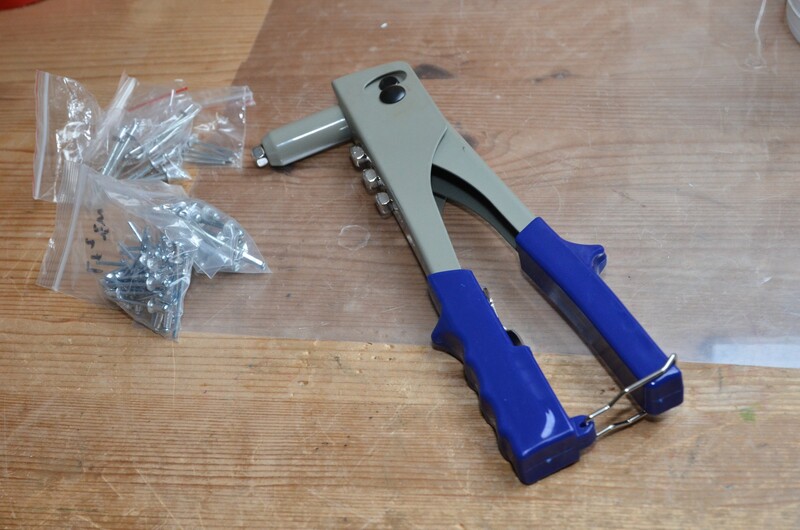 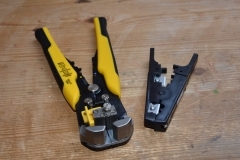 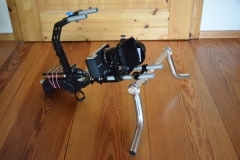 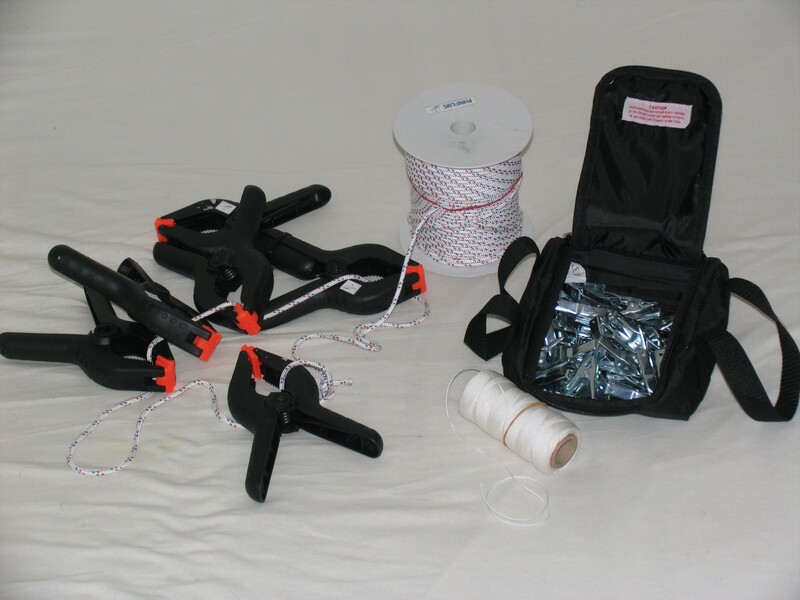 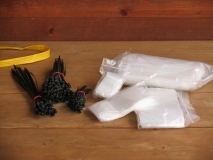 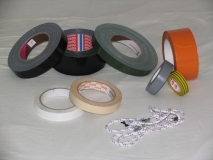 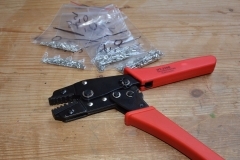 The rod clamps, the shoulder pad, the c-arm and the quick release system are bought online, the 15mm rods at the hardware store and the handles are self made. 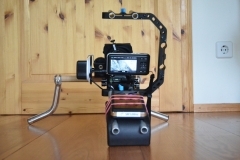 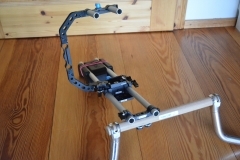 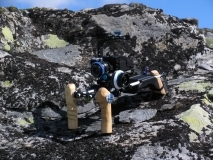 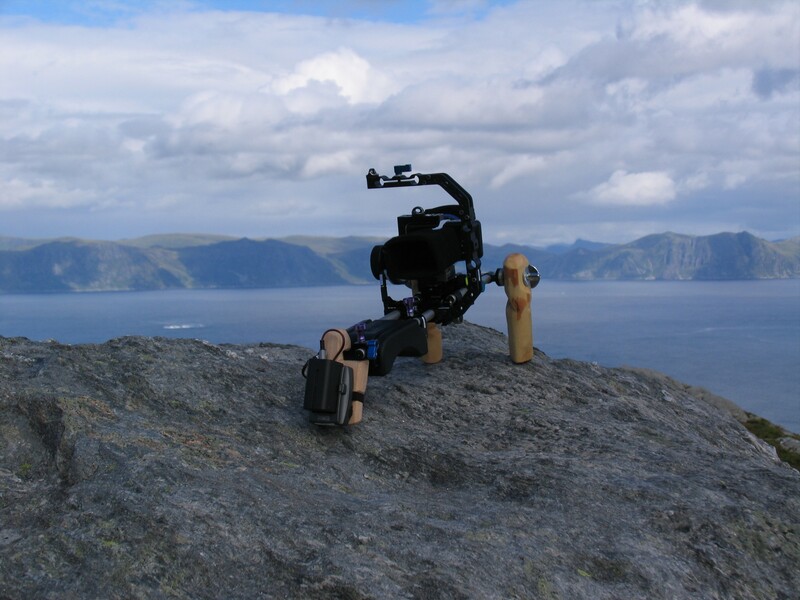 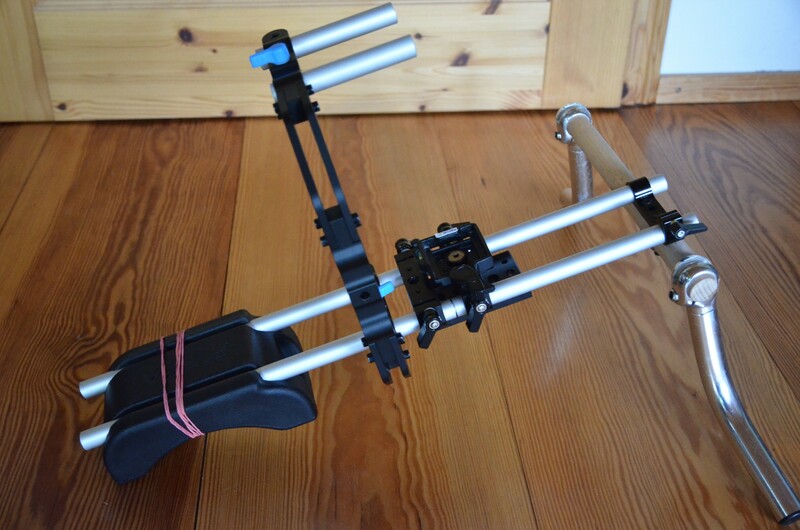 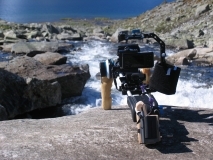 The base of the rig, consisting of two dual rod clamps and one cheese plate from SmallRig. 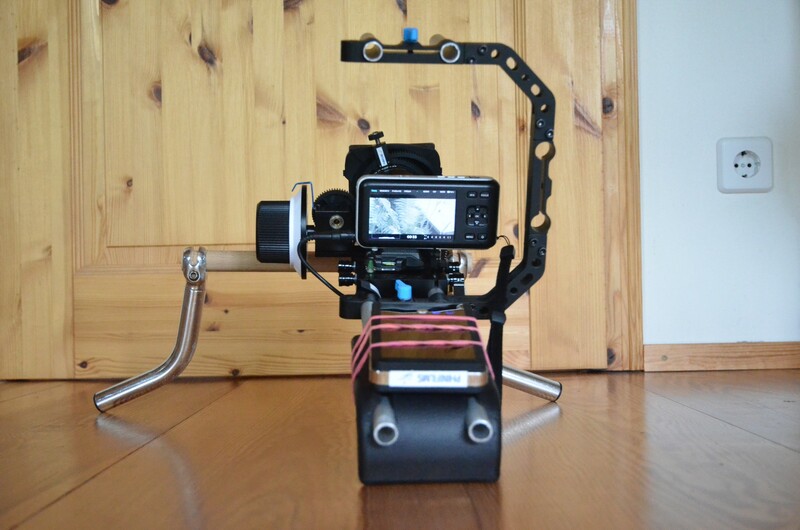 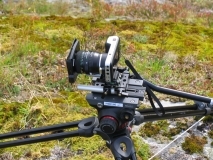 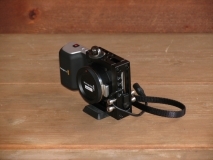 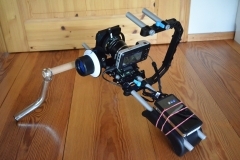 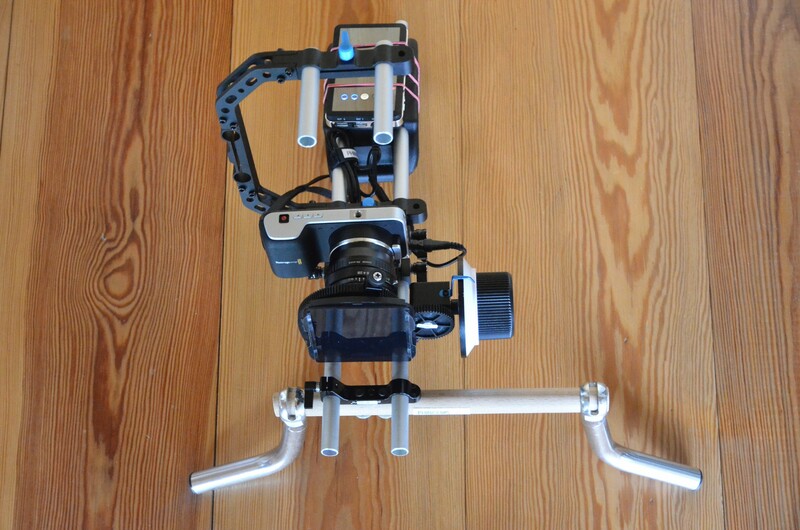 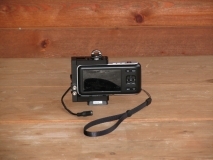 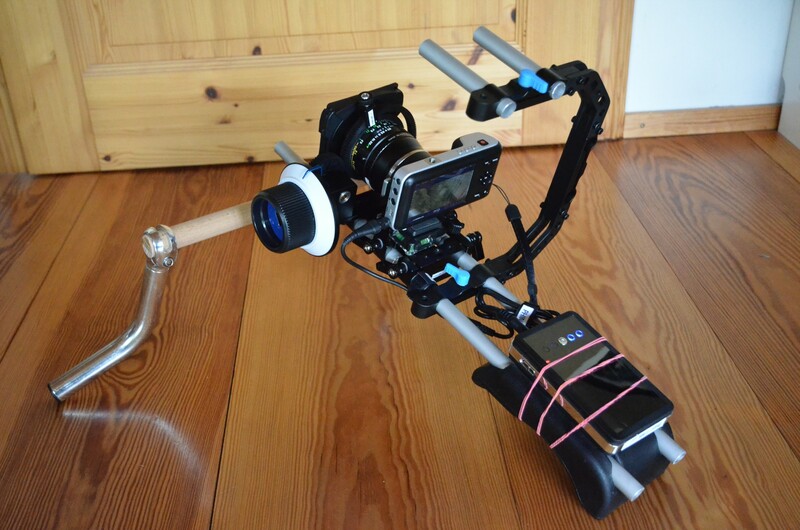 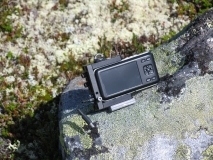 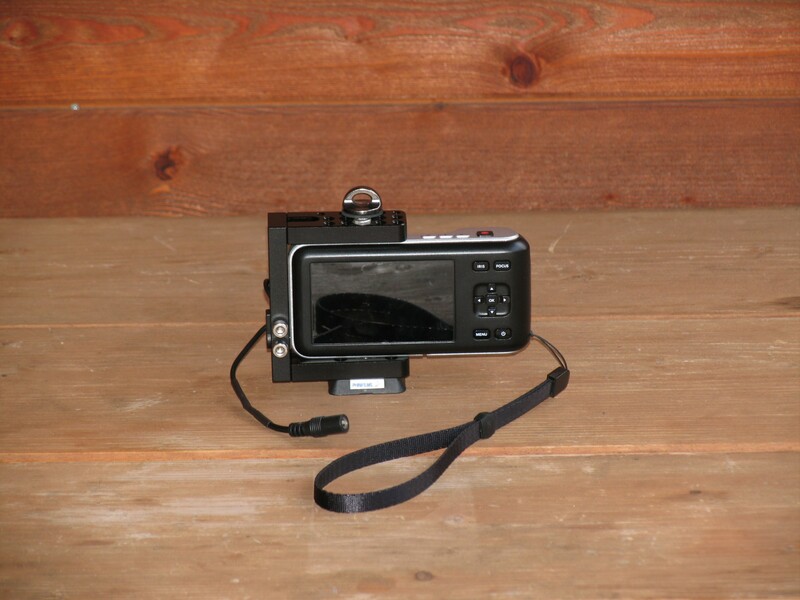 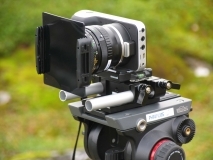 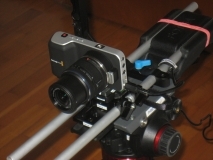 A cage from SmallRig to protect the Pocket and make mounting it onto the rig more stable. 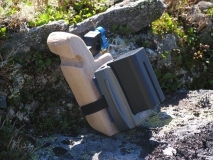 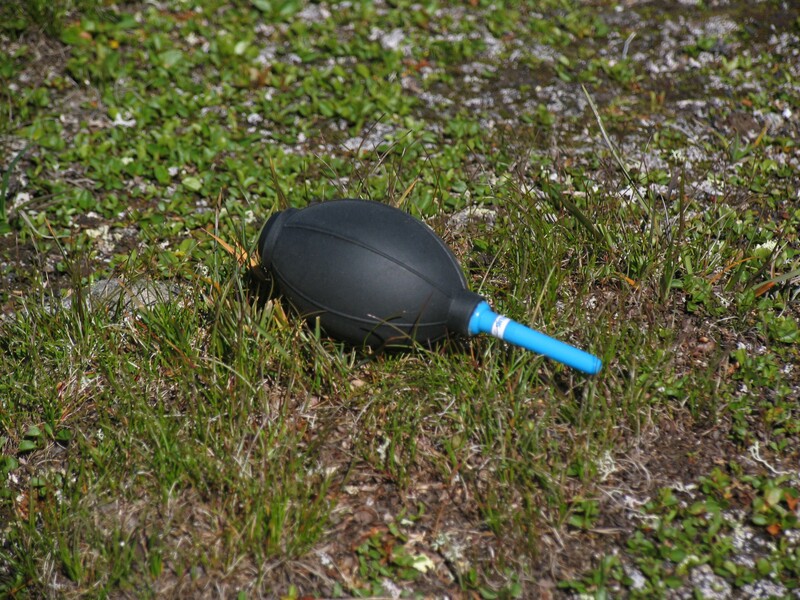 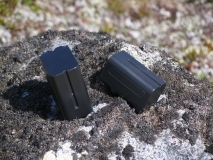 A simple foam shoulder pad from Fotga. 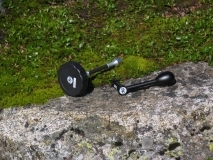 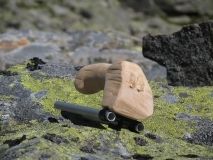 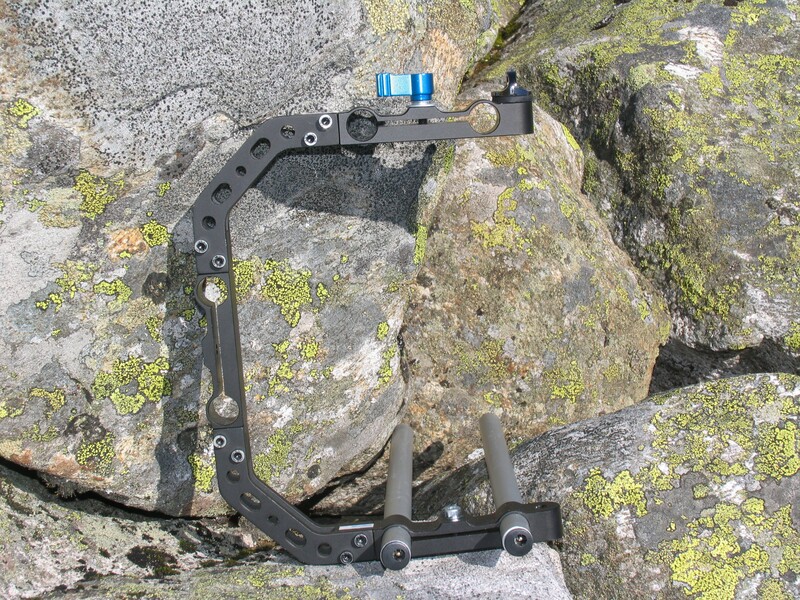 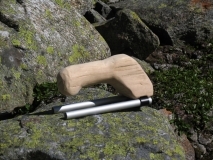 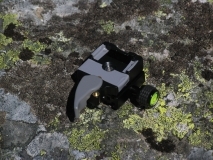 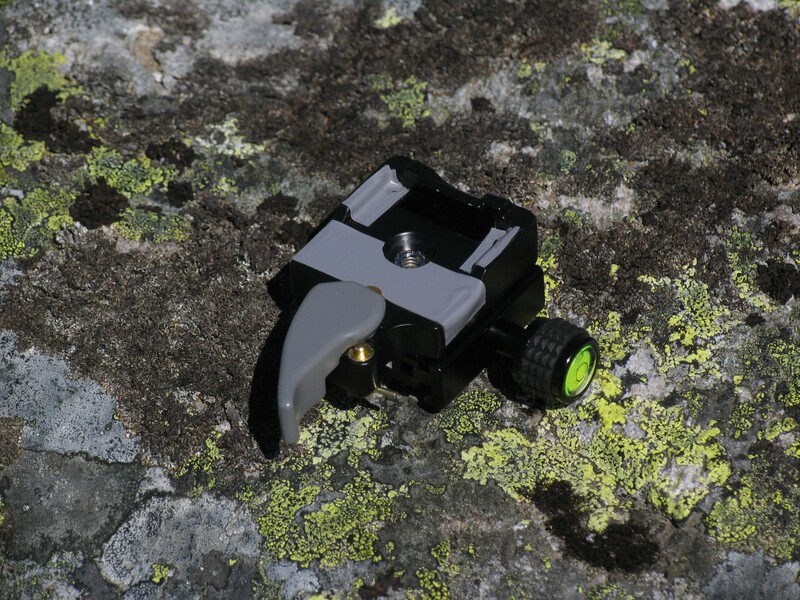 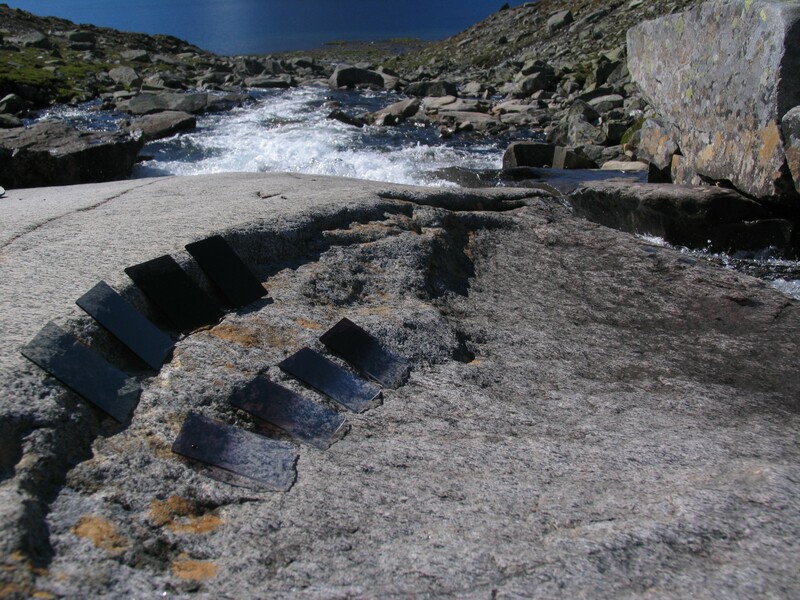 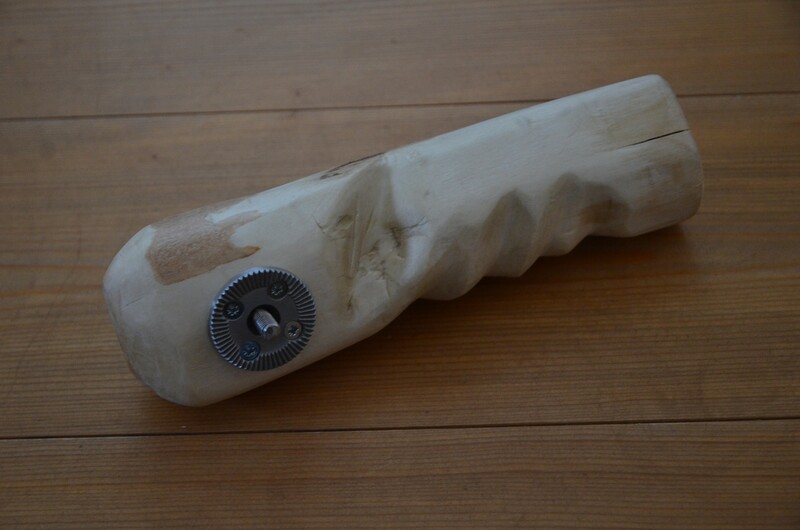 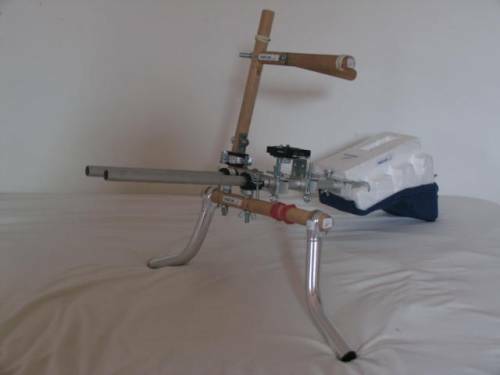 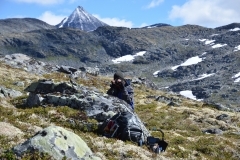 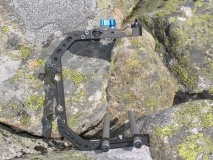 The c-arm as well comes from Fotga. 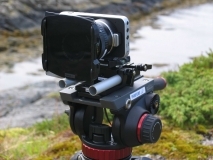 As a QR-Sytem I curently use a combination of Arca-Swiss style plates and -clamps as well as the Manfrotto 323- and PL200-replica. 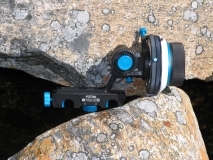 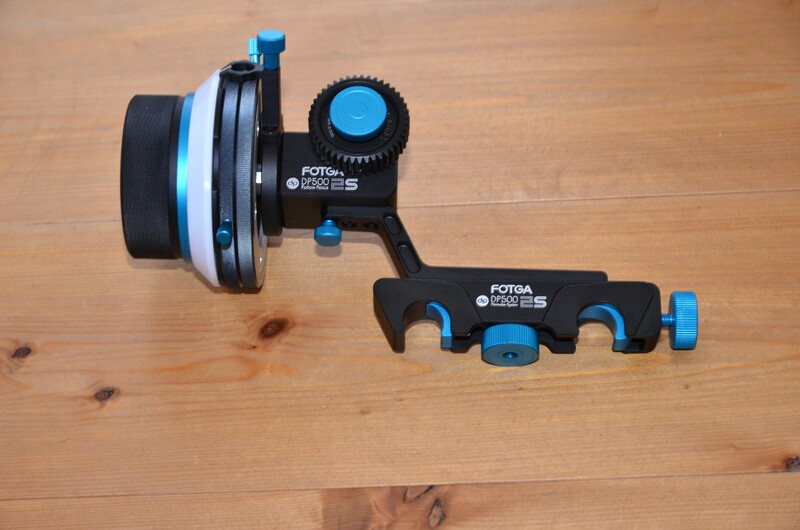 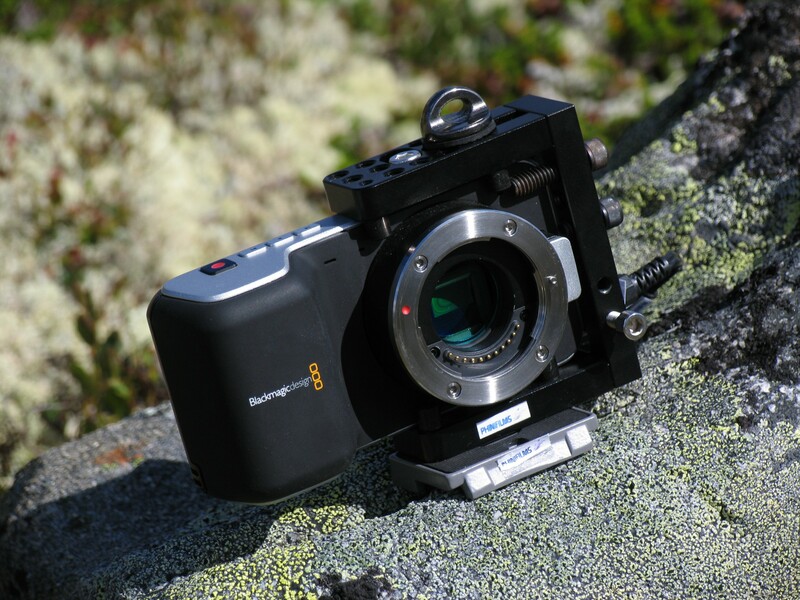 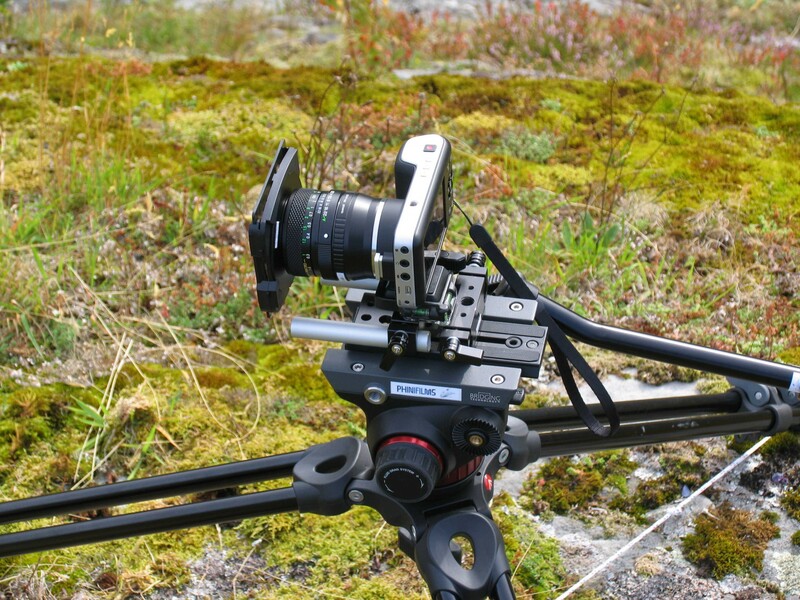 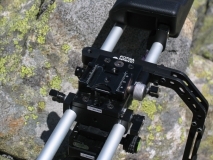 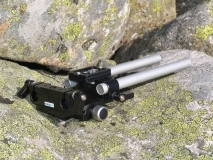 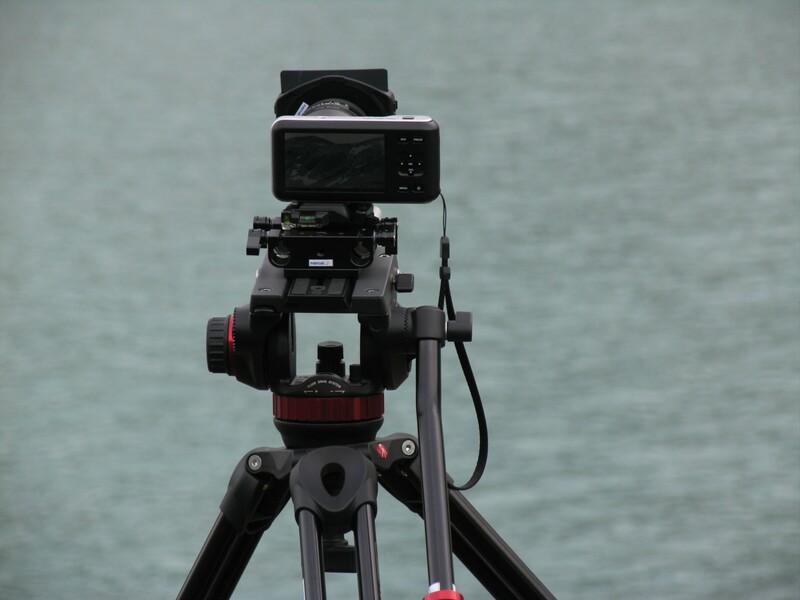 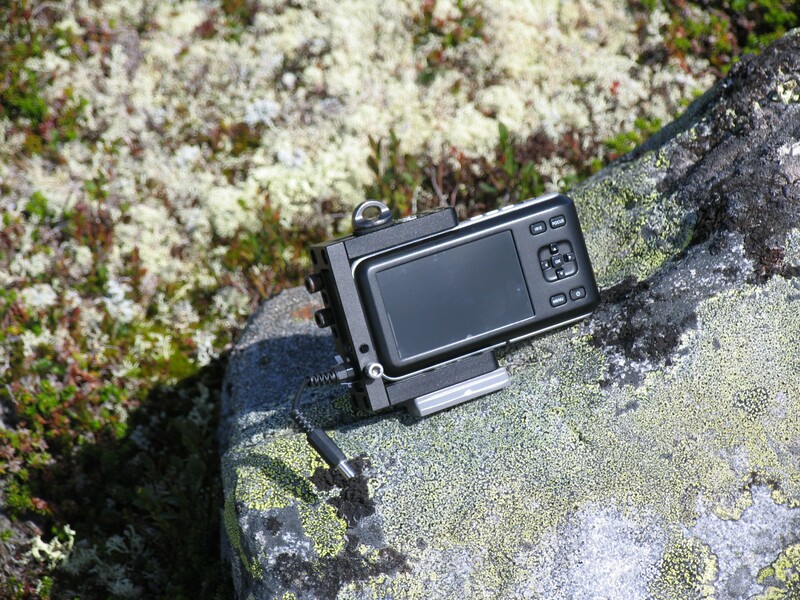 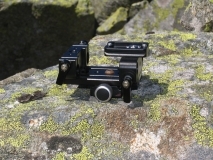 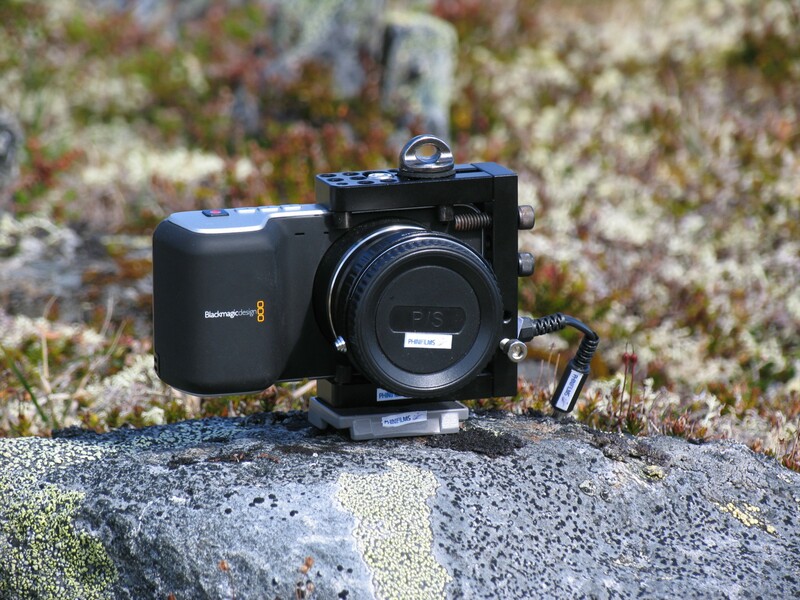 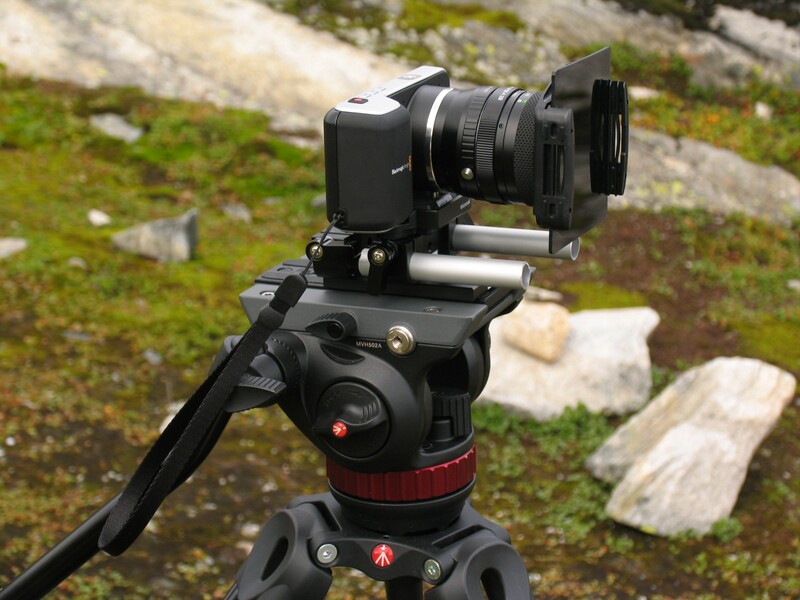 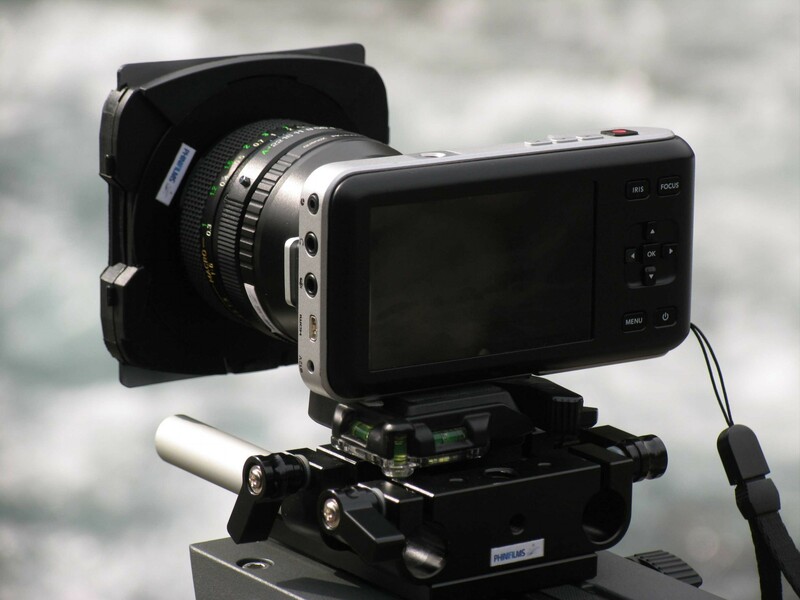 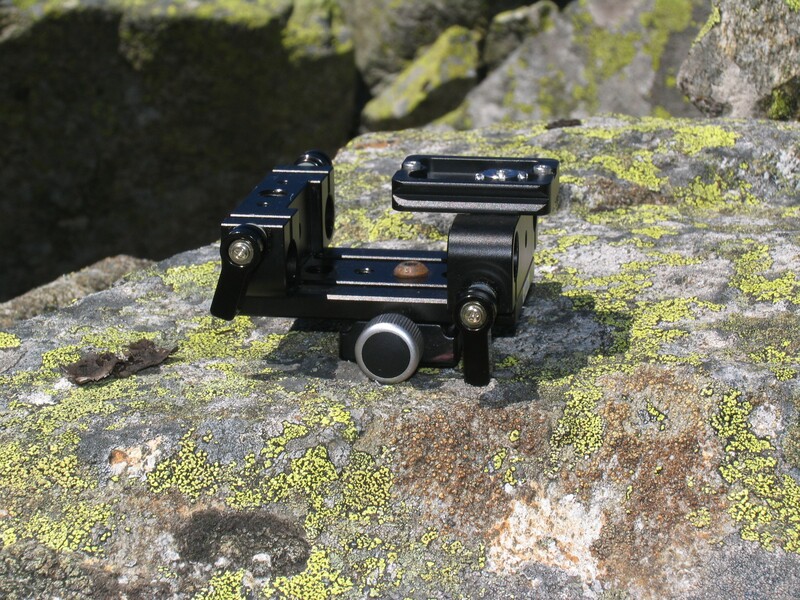 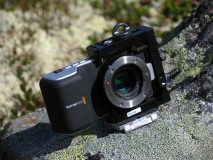 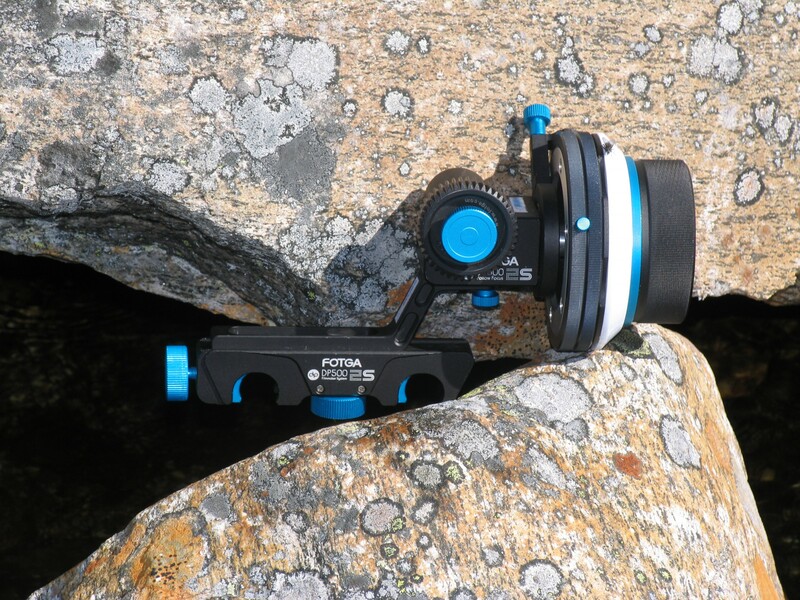 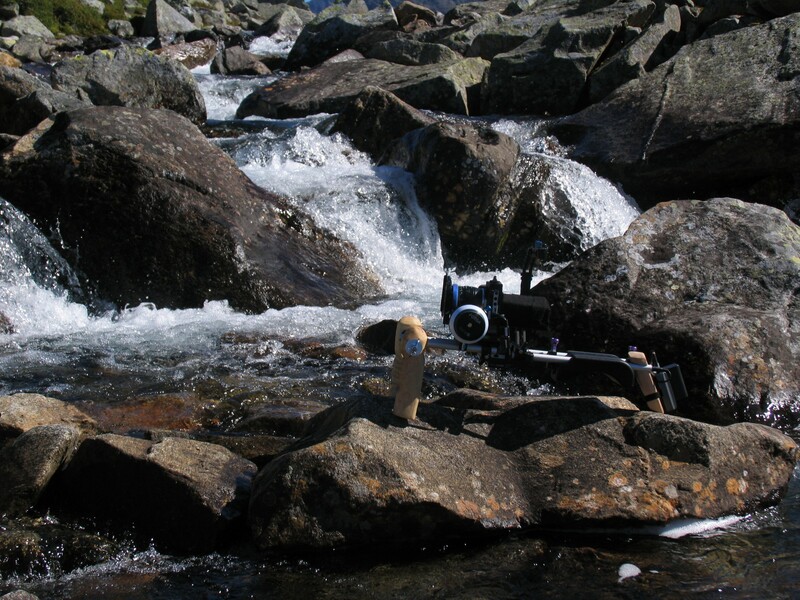 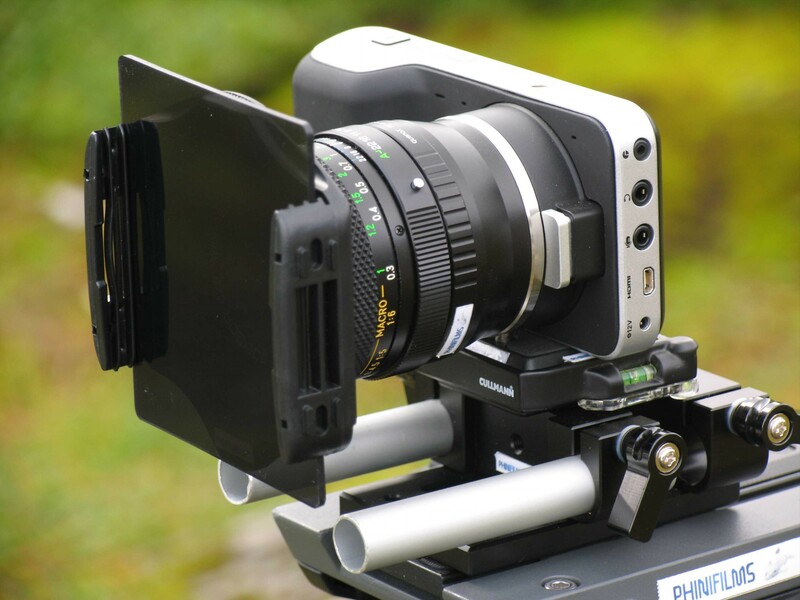 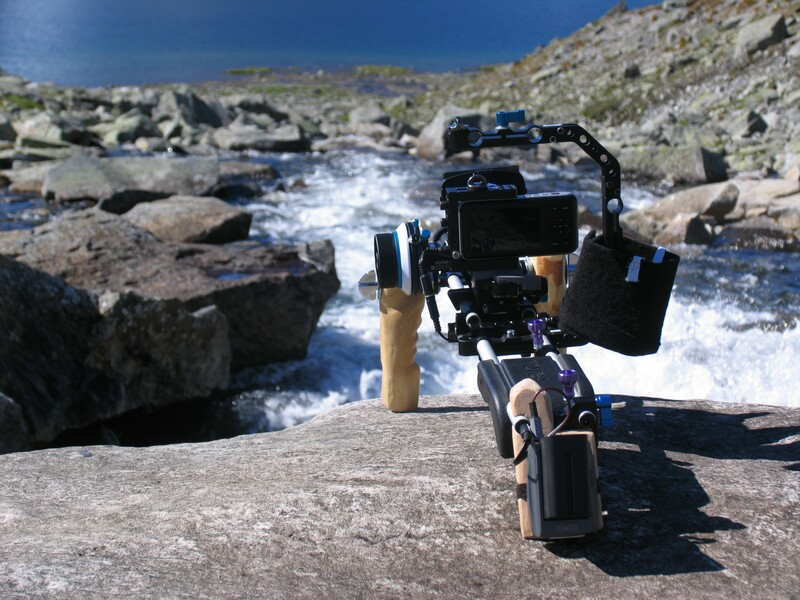 The Fotga DP500IIS with A/B hard stops and an open Rod-Clamp for making it easy to mount onto the rig. 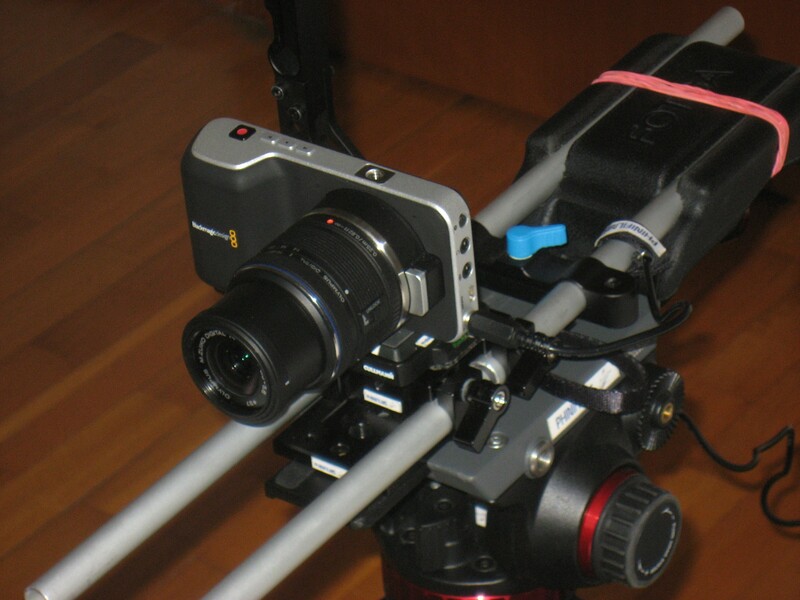 After researching and testing for a long time I finally found a good solution for powering my BMPCC-Rig: Sony L-Series NP-F-batteries. 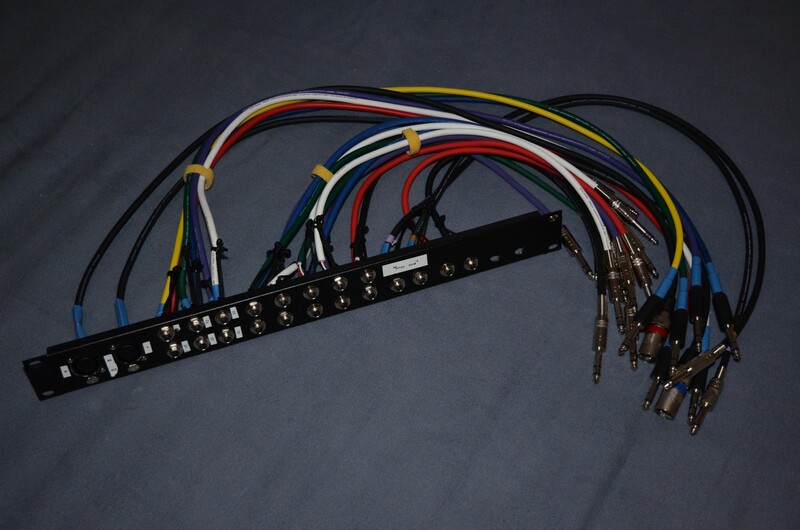 For this I bought a battery plate with built-in 12V-booster an built a rig-mounting-plate for it. 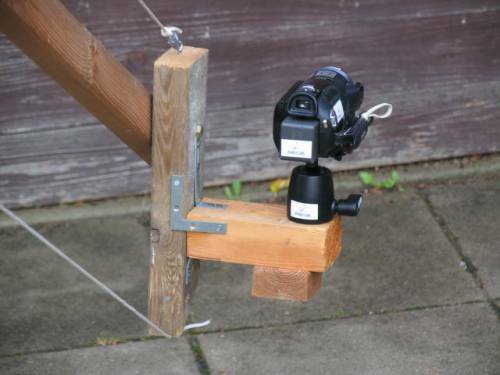 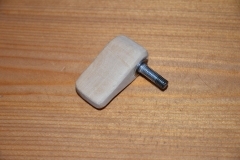 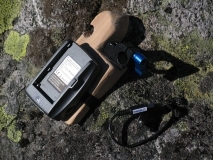 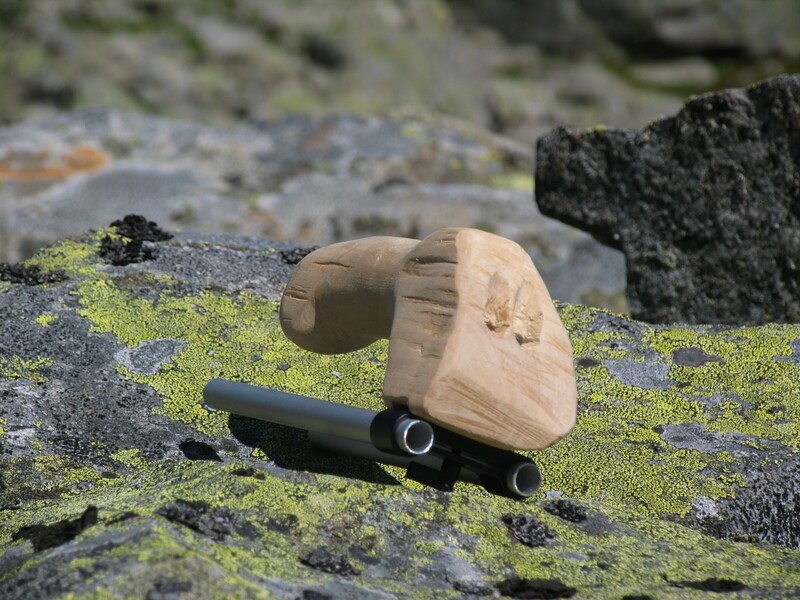 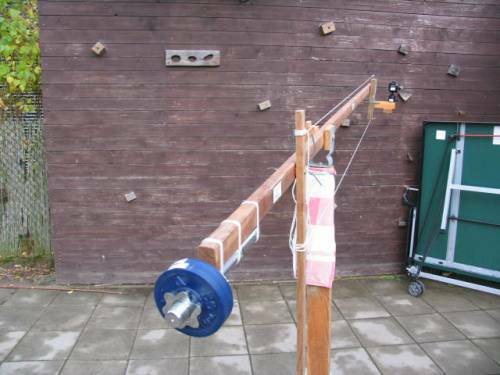 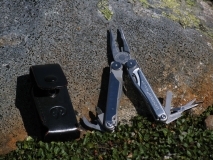 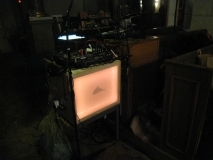 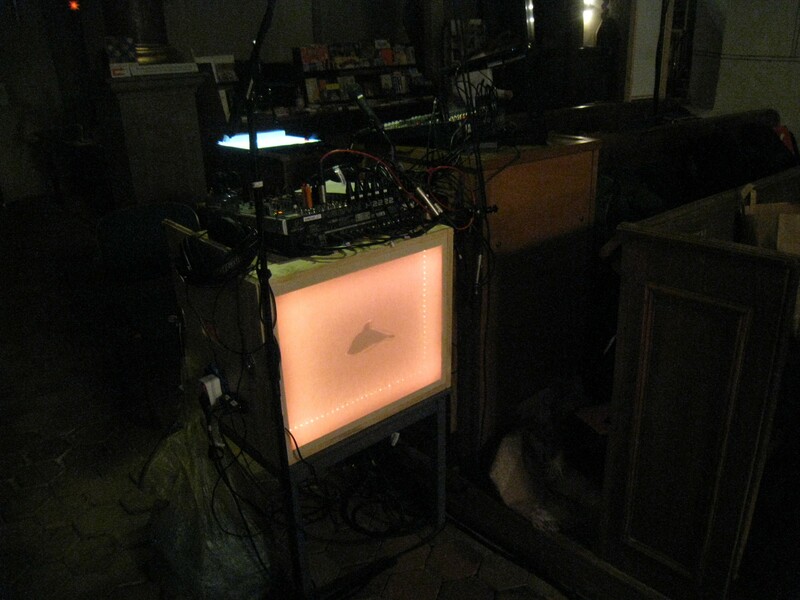 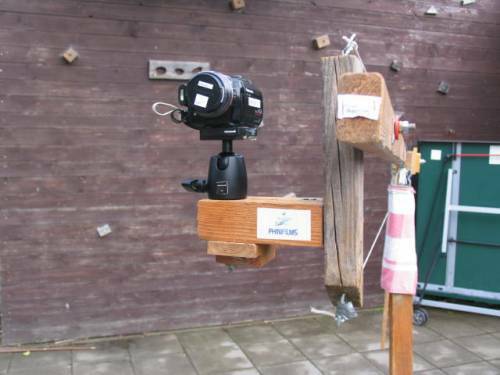 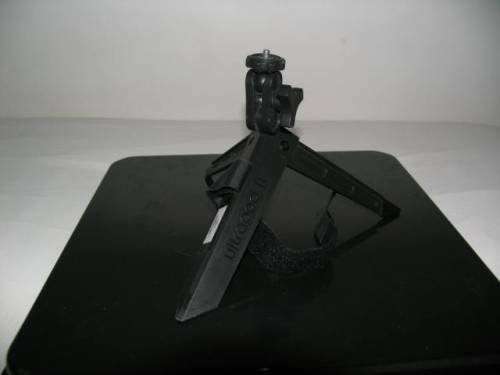 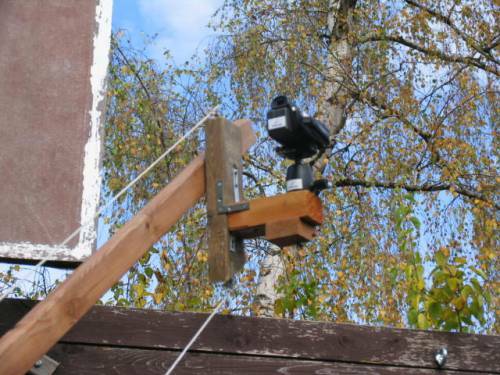 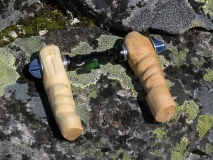 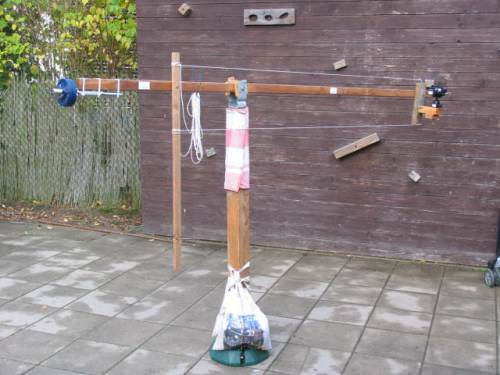 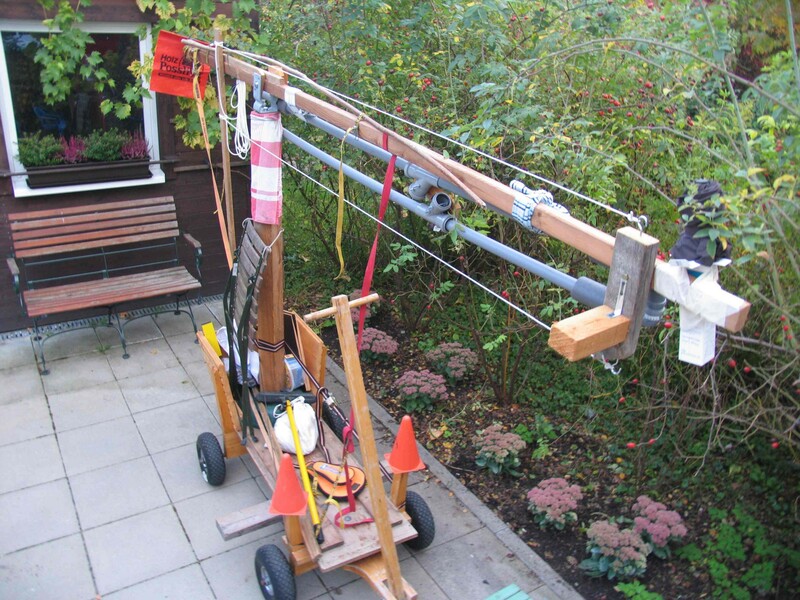 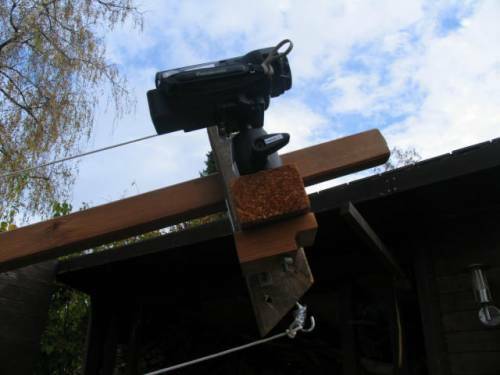 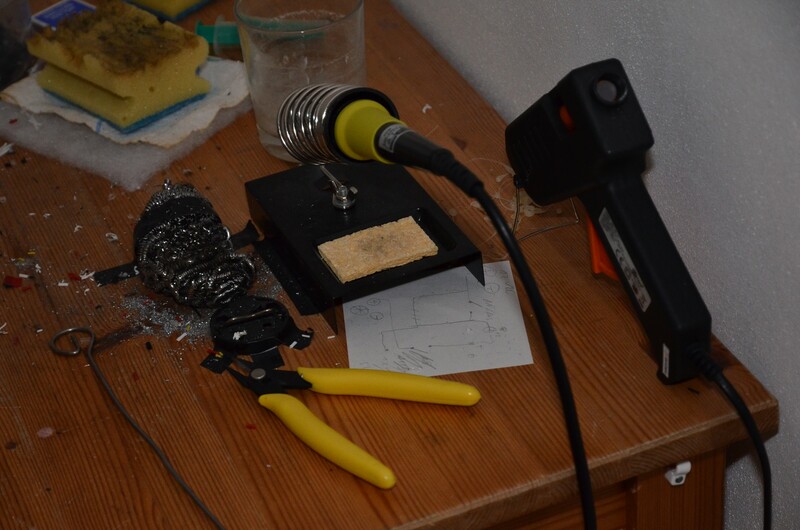 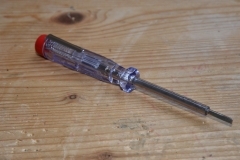 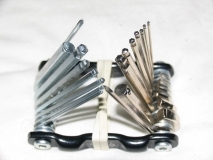 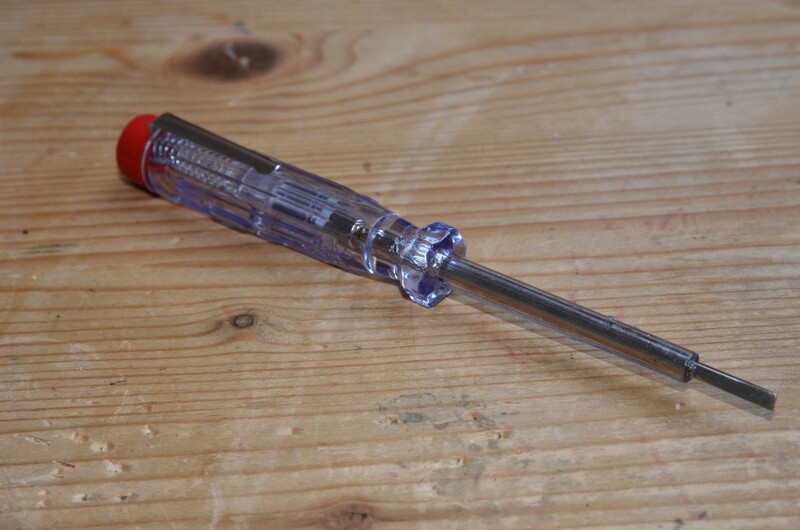 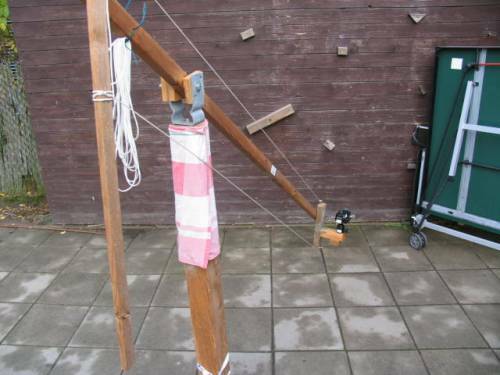 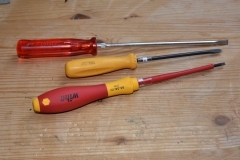 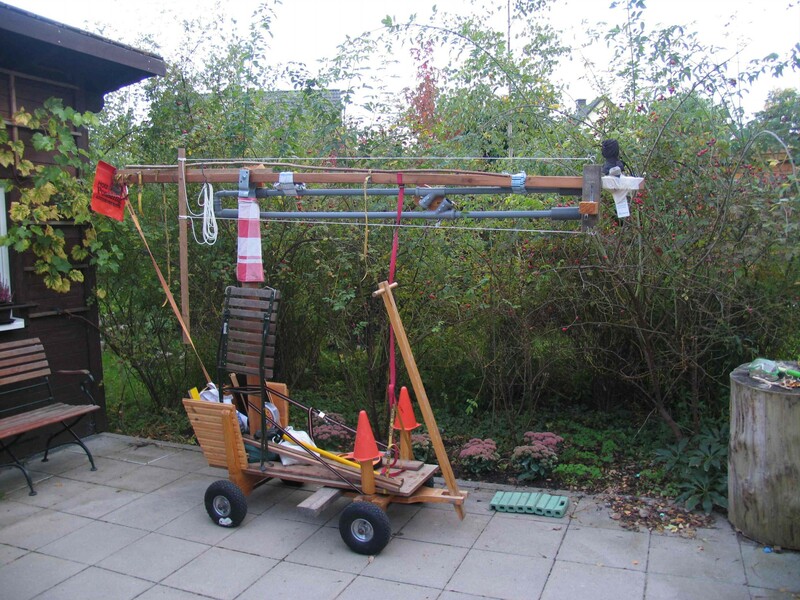 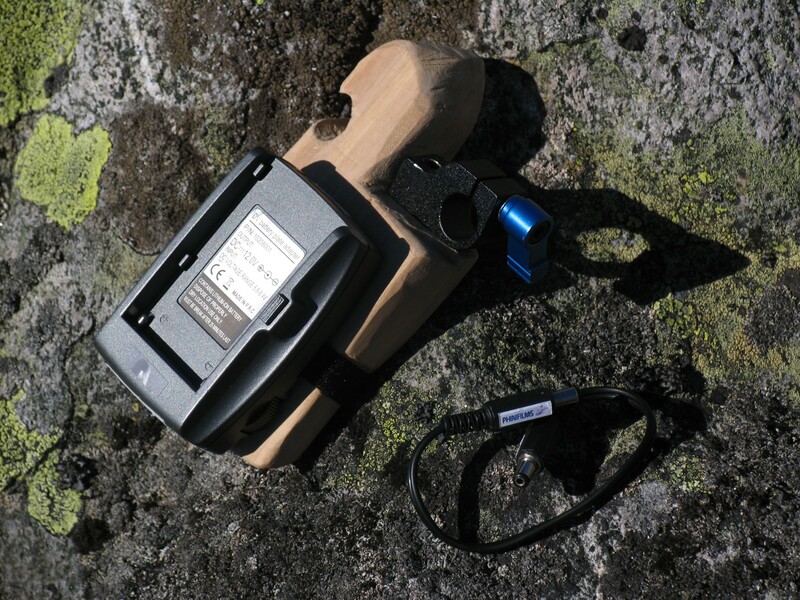 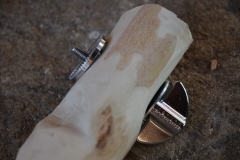 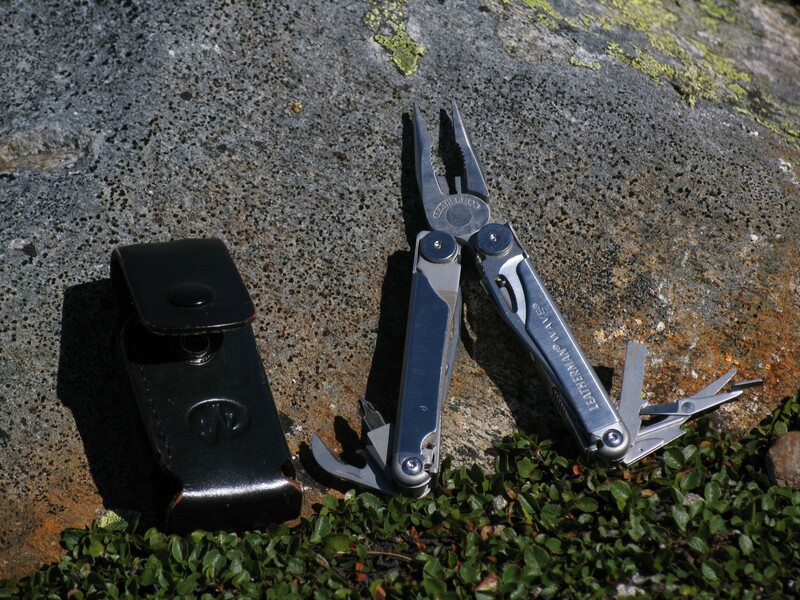 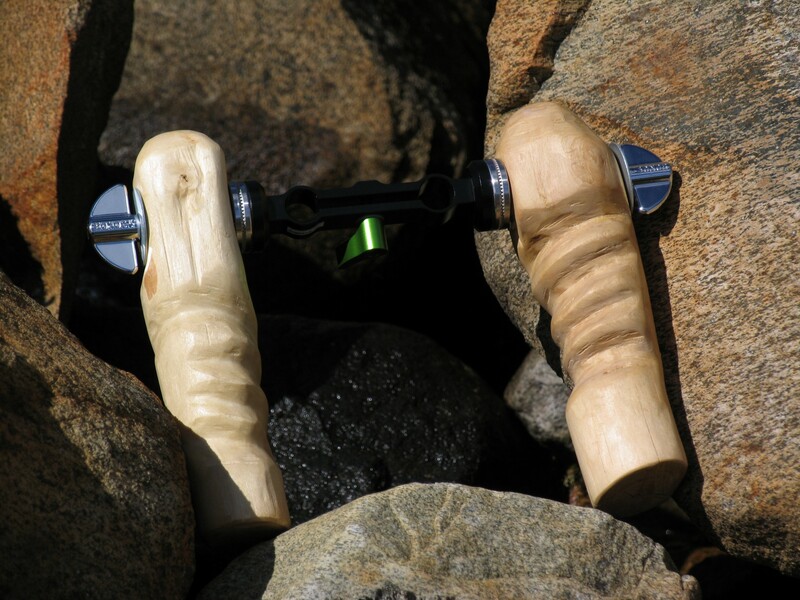 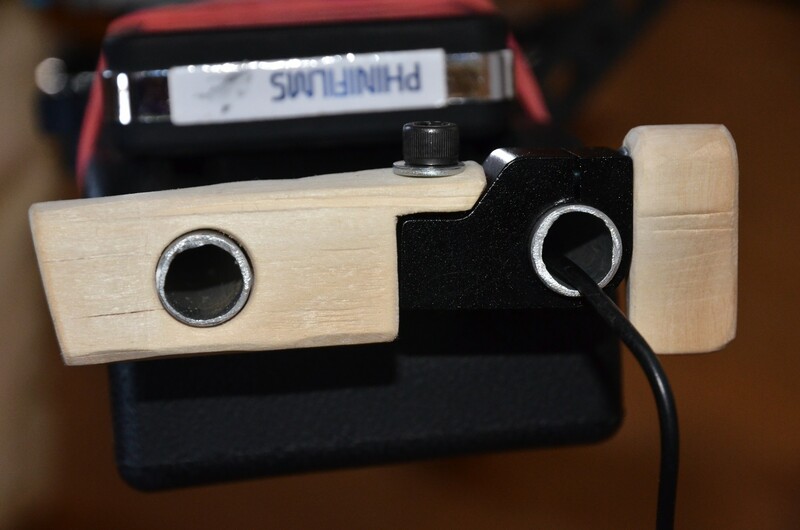 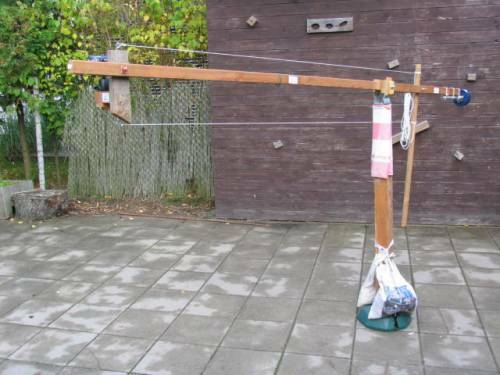 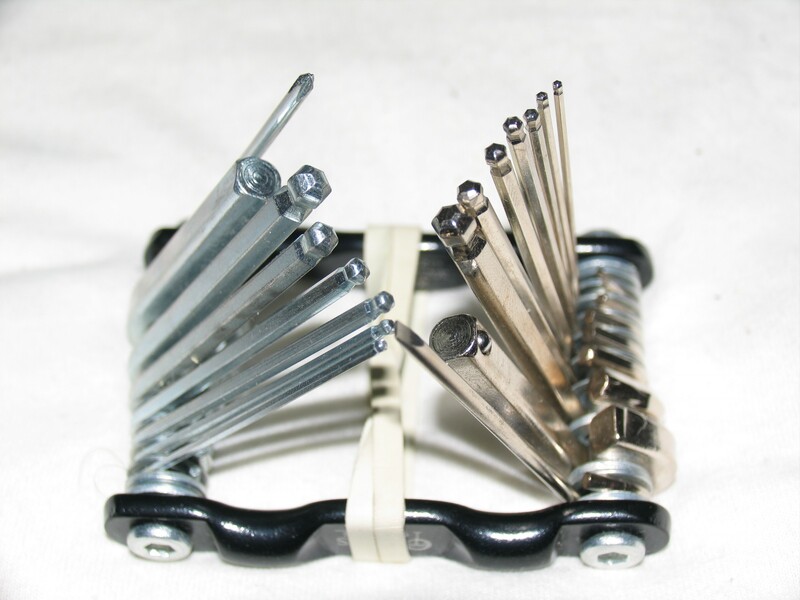 Self-Made accessories for the rig: A double-rod-clamp consisting of a cheap single-clamp and a piece of wood; several self-made wing screws fro wood with a piece of threaded bar glued in. 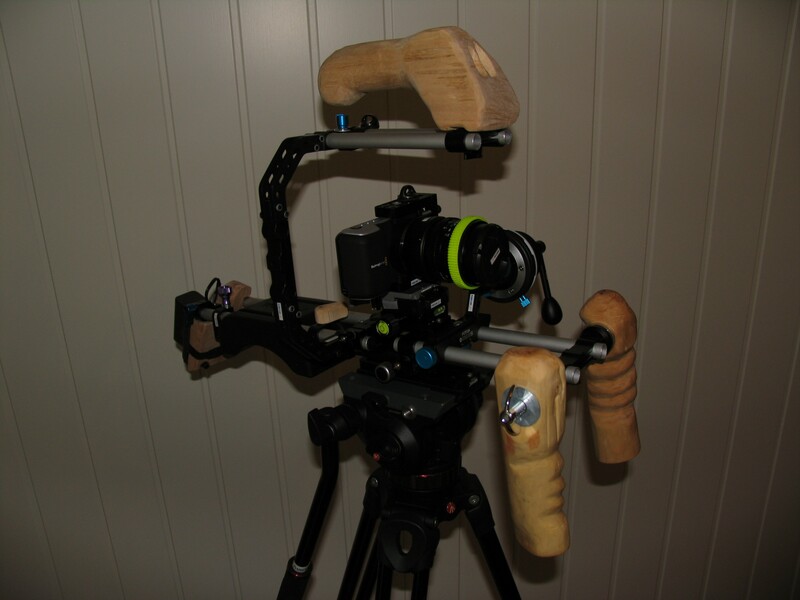 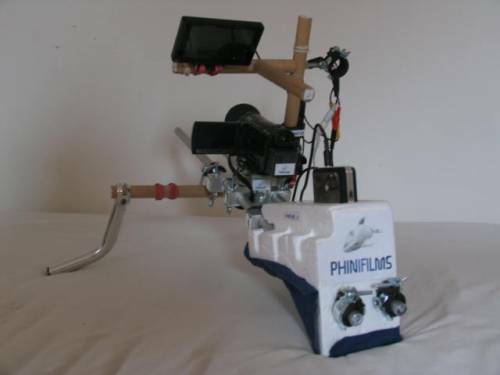 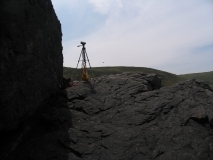 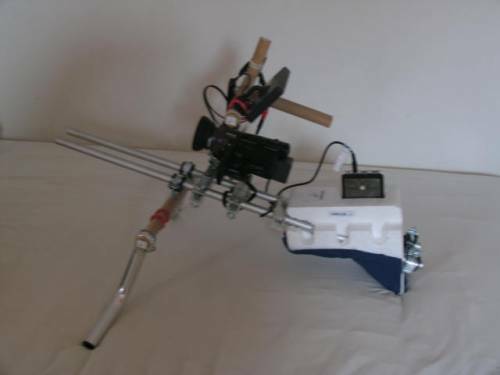 This early version of the shoulder rig doesn&apos;t exist anymore, it has been reconfigured (see above). Due to the fact I now own a way more complex camera rig I rarely use the X-GRIP by Opteka anymore, but it&apos;s still good when size and weight of the used equipment matters, or when the rig already is in use. 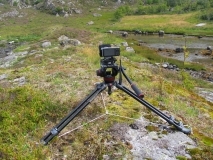 Some of the equipment I didn&apos;t built myself are my tripods. 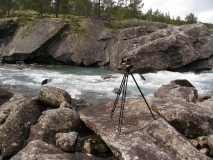 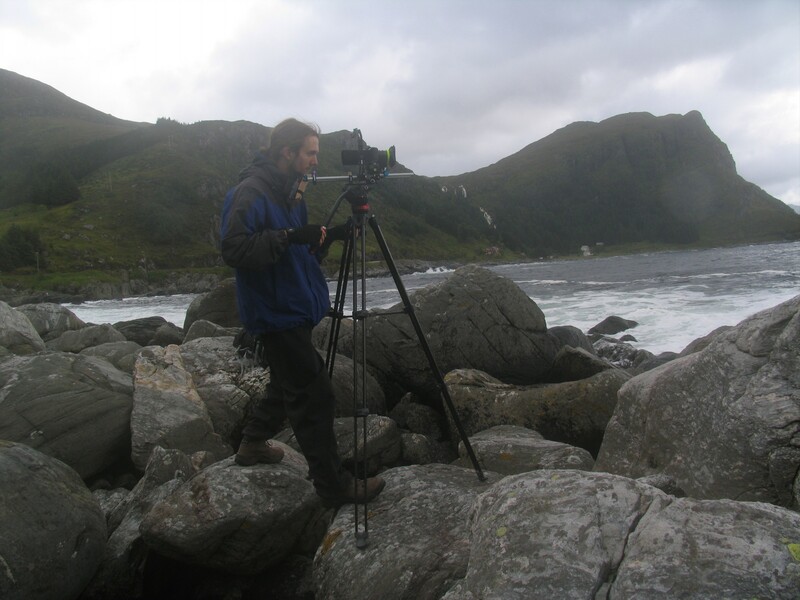 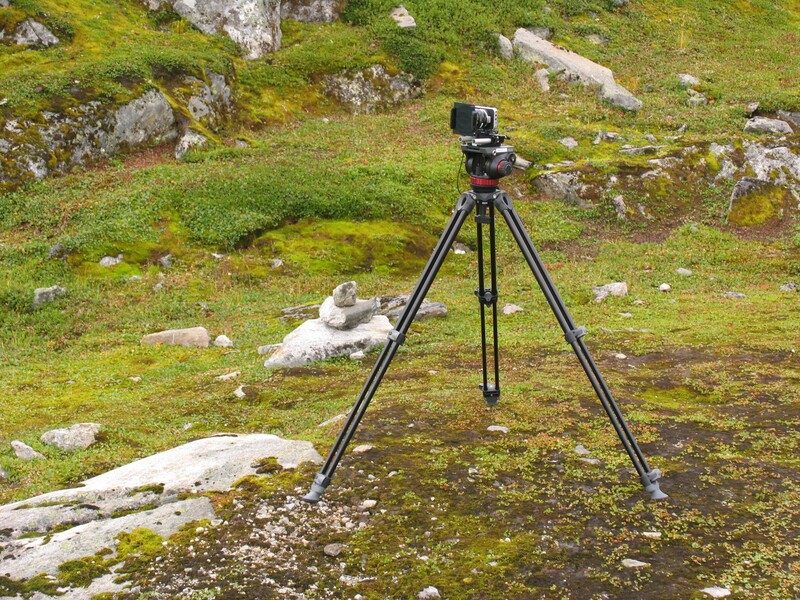 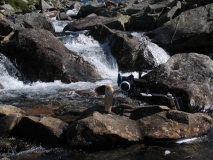 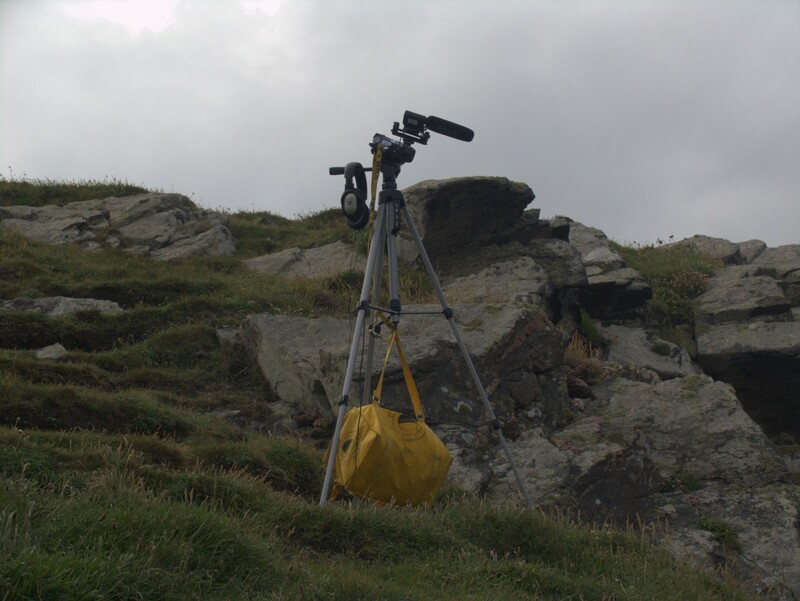 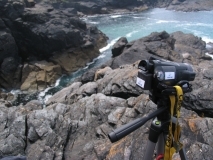 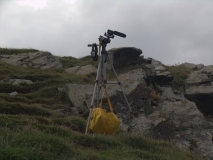 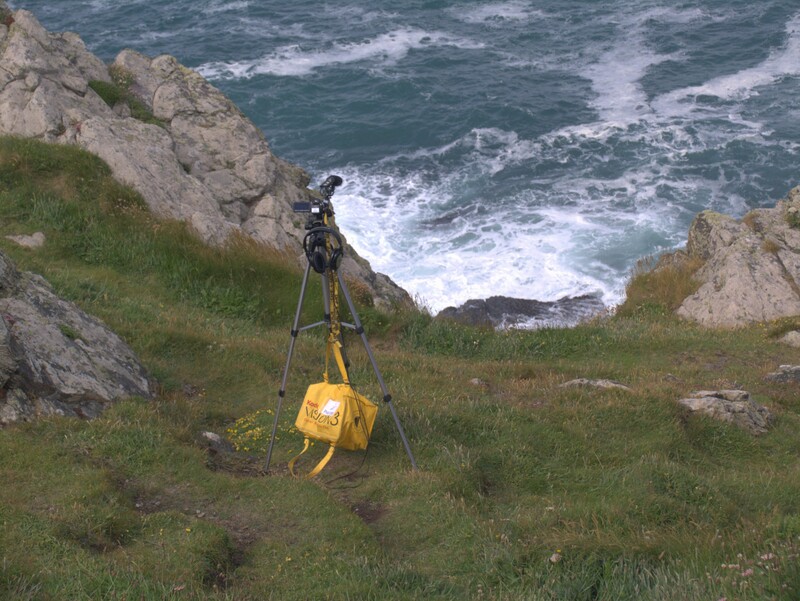 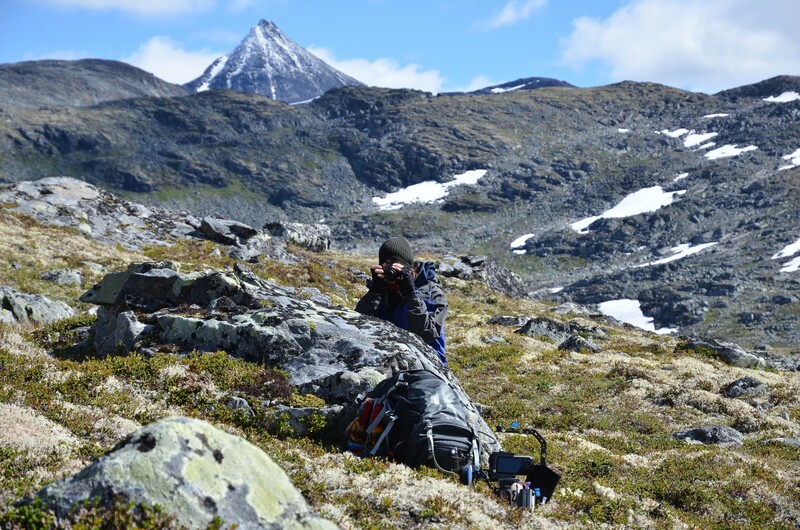 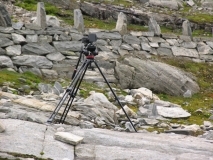 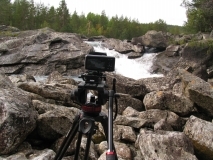 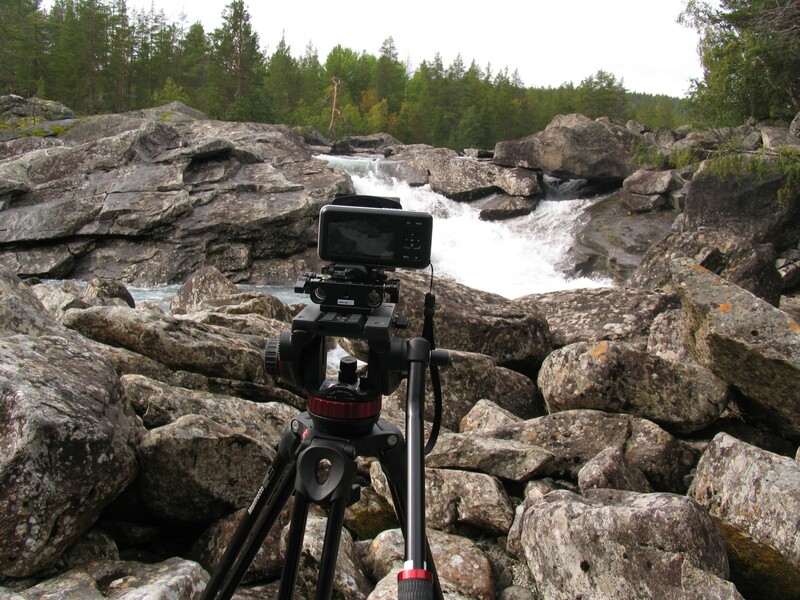 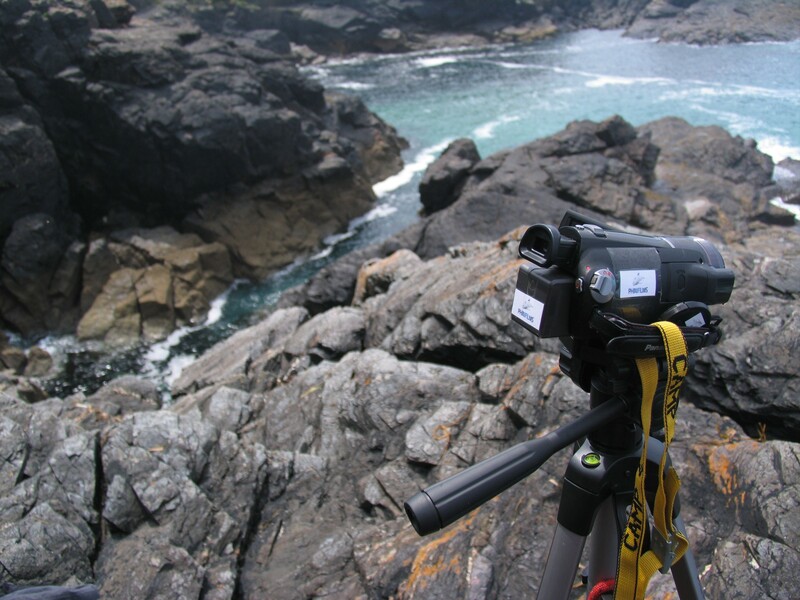 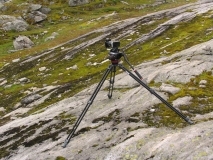 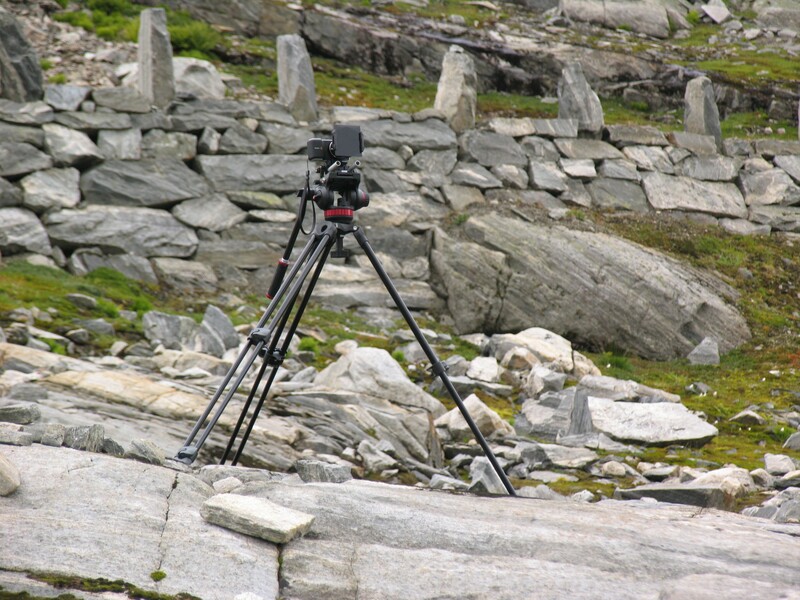 My biggest, most stable, most expensive and simply best tripod is by Manfrotto; it consists of the tripod legs MVT502AM and the fluid head MVH502A. 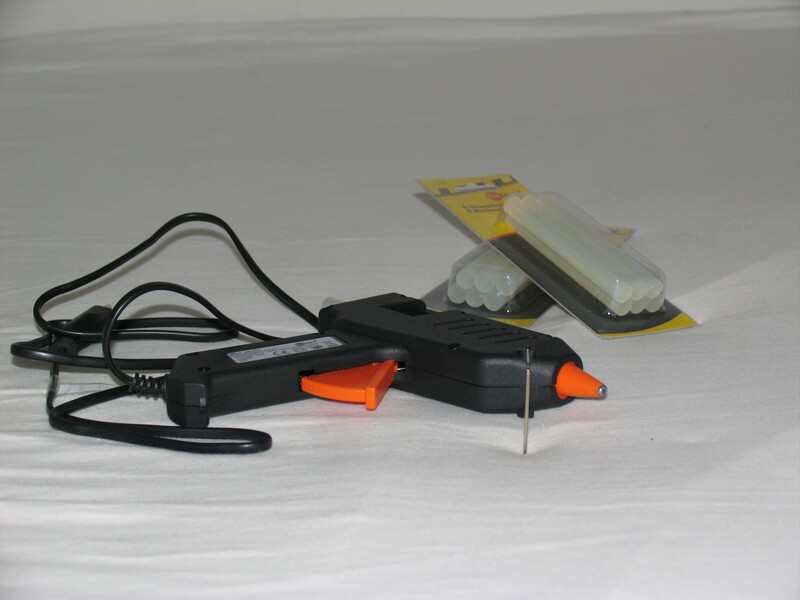 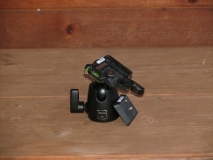 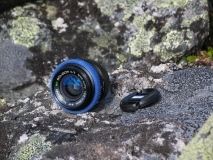 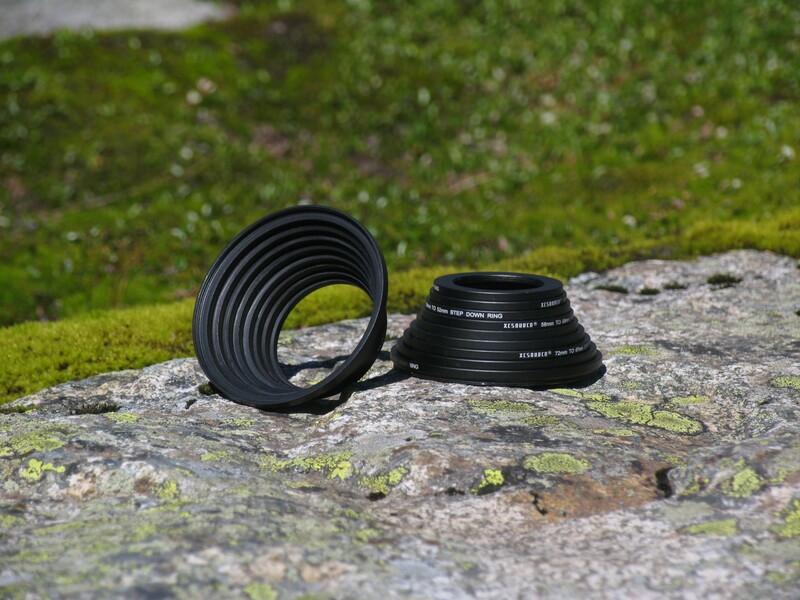 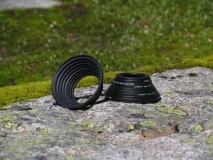 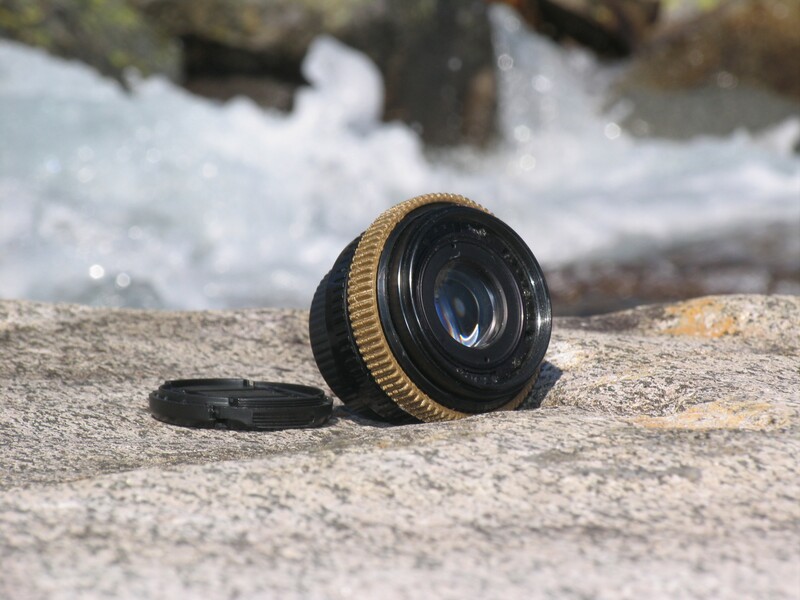 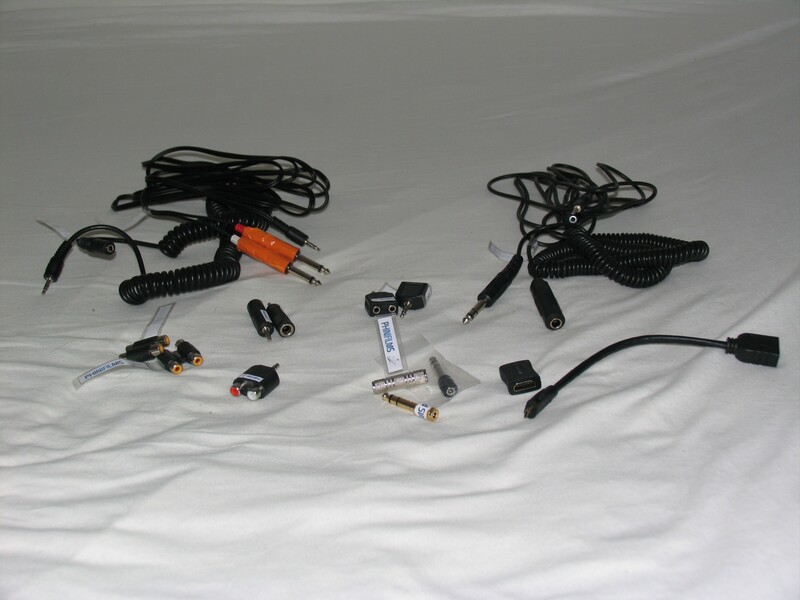 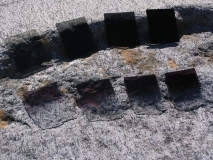 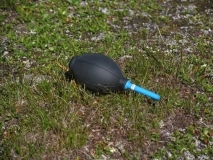 The smallest one which has a small ball head can be mounted nearly everywhere with a strip of velcro. 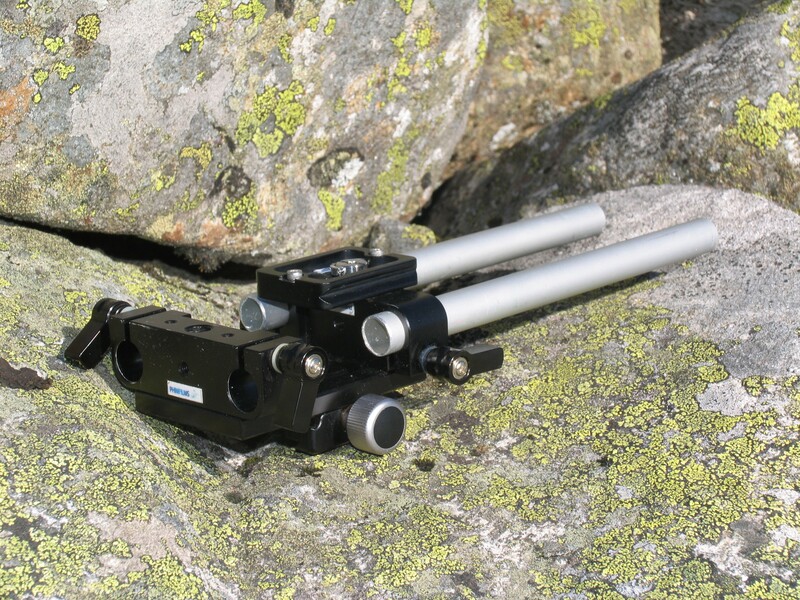 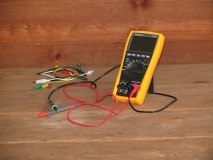 The Cullmann Alpha 2500 is cheap, lightweight and very compact when broken down, but extended it reaches a valuable height. 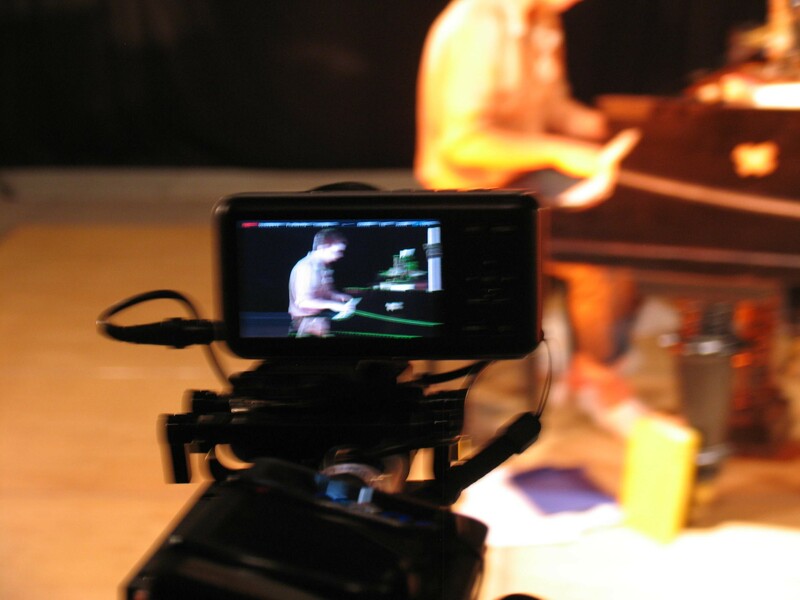 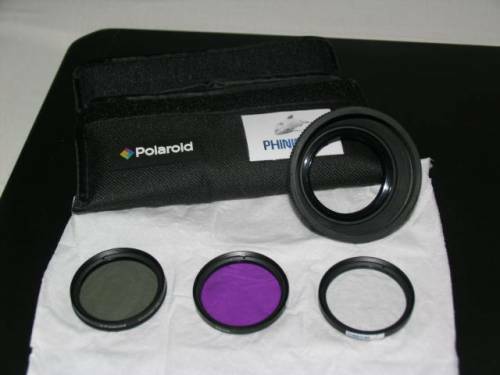 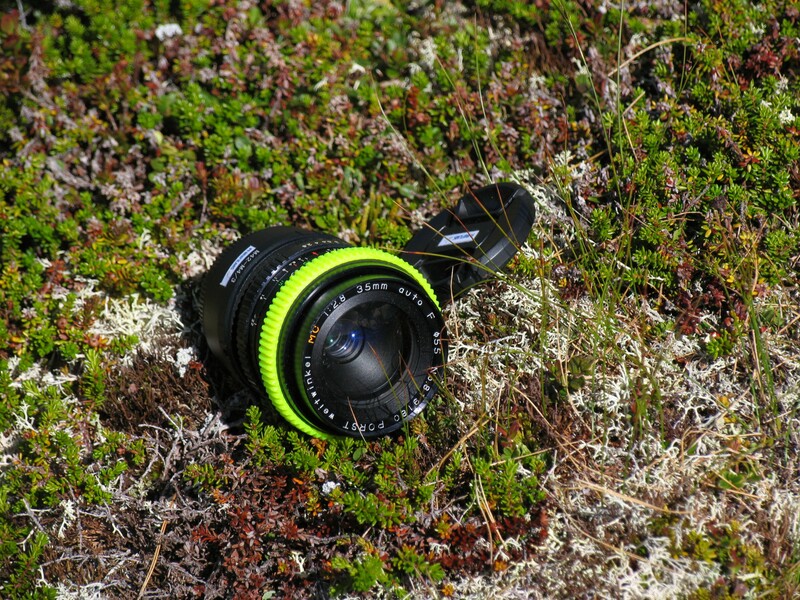 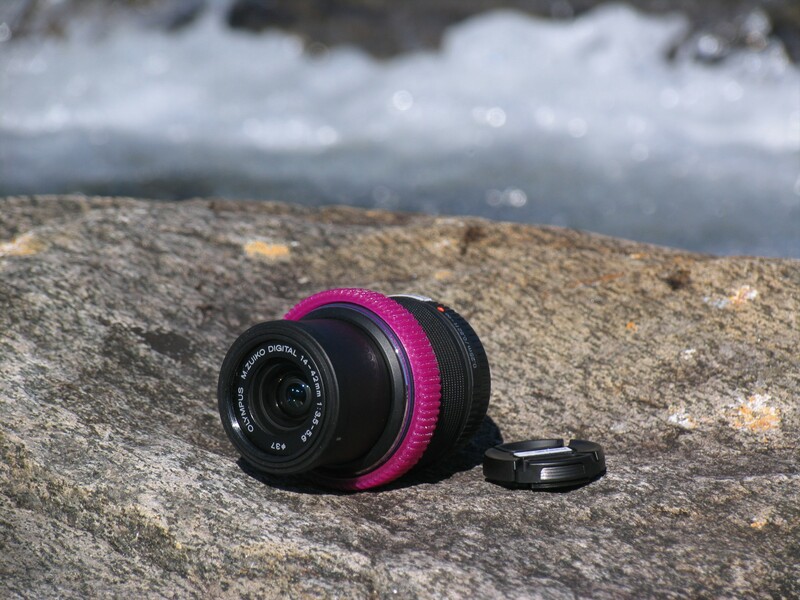 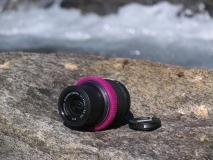 But it only has a fricton head what makes it difficult to impossible to get smooth pan and tilt shots. 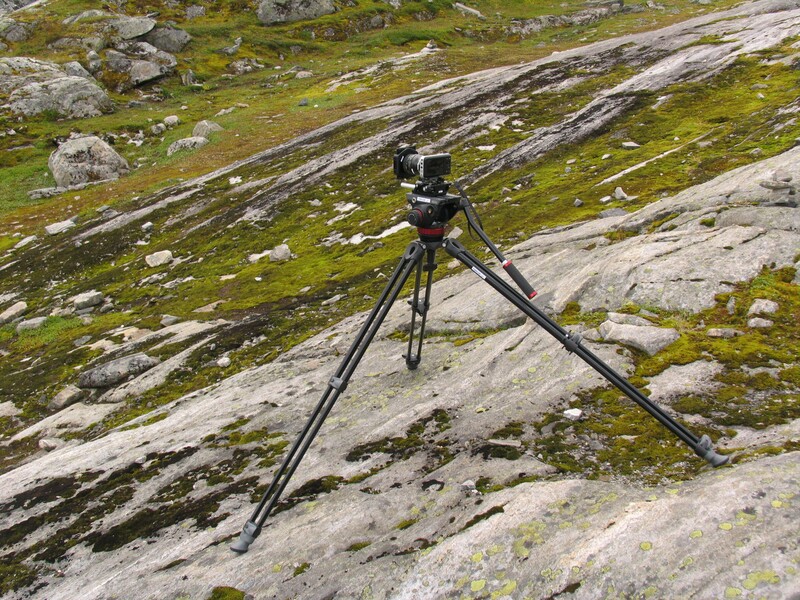 So this is a tripod for static shots. 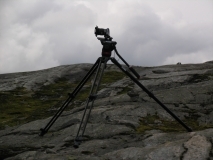 Out of a Christmas tree stand, one short and one long balk, three short bars, some screws and bands and an old barbell (previously a sack full of gravel) I built a jib, with which one can make pretty cool shots. 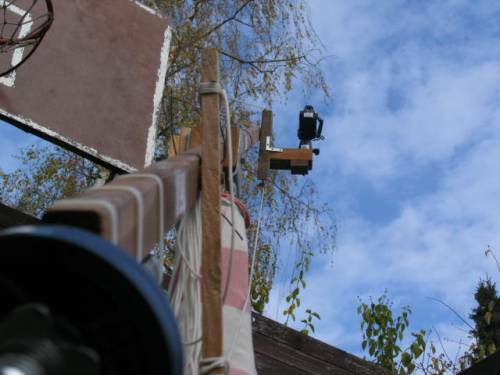 I mounted a Cullmann CB7.1 ball head as camera mount which makes it easy to position an level the camera on the jib. 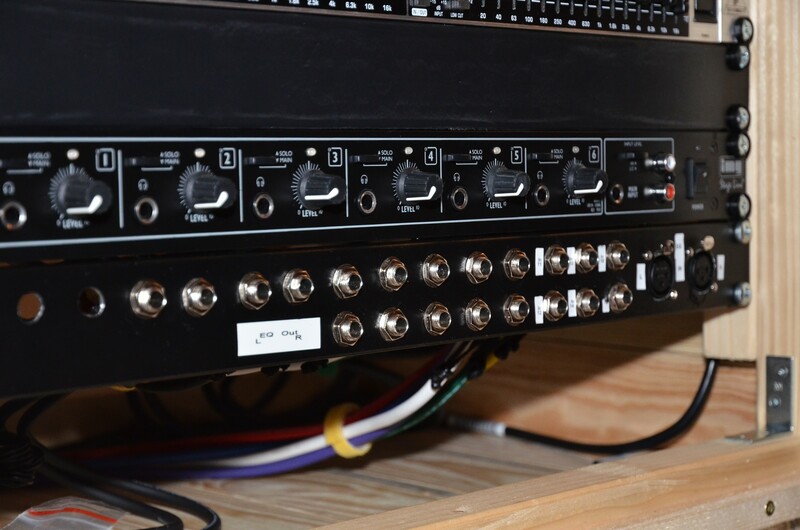 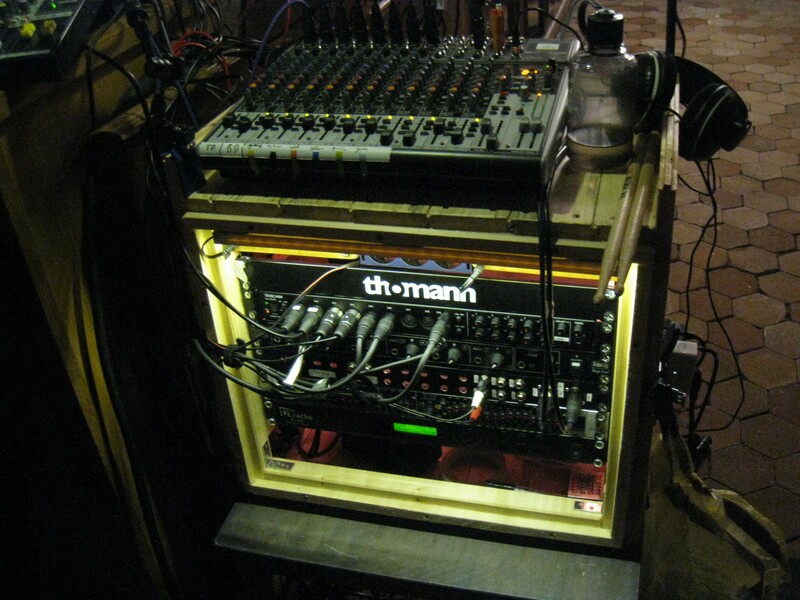 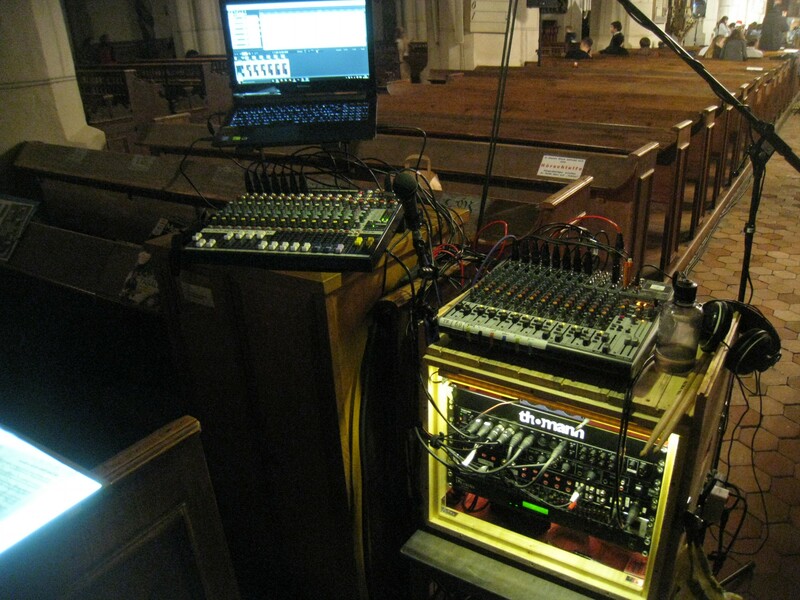 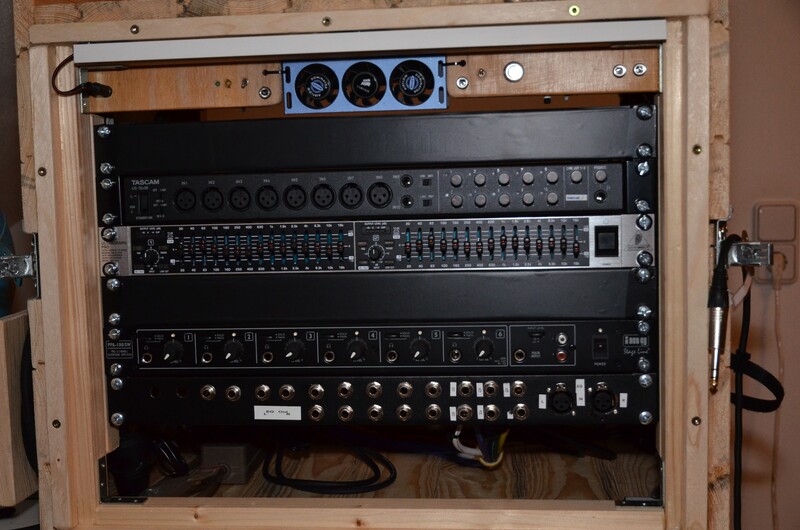 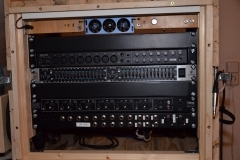 It is nice to have all sound devices for concerts and events in one place, so I built myself a Rack-Box. 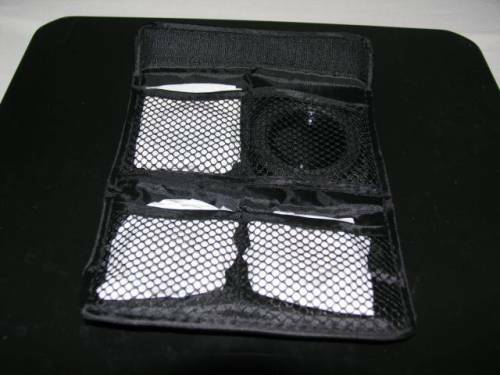 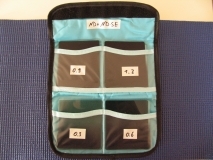 It holds all my 19-Inch audio devices. 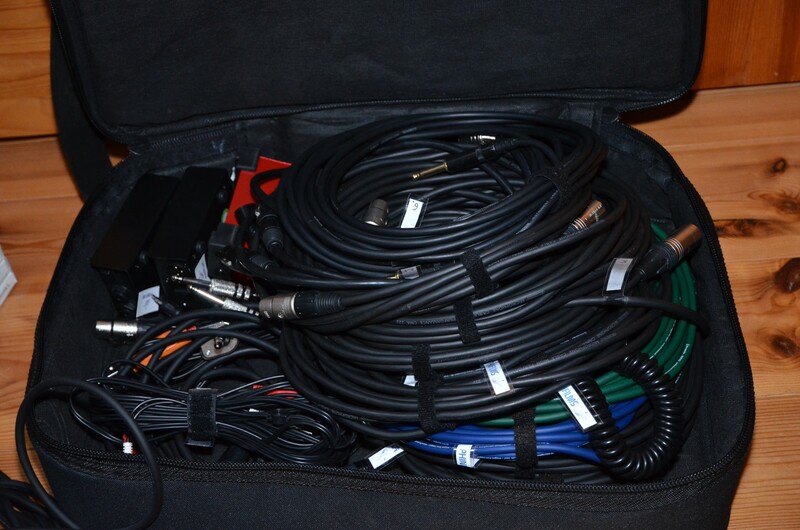 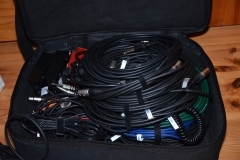 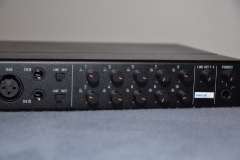 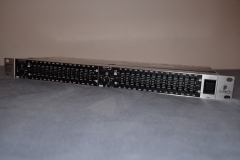 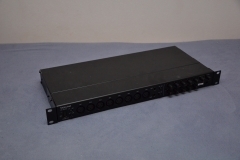 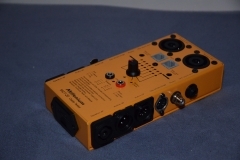 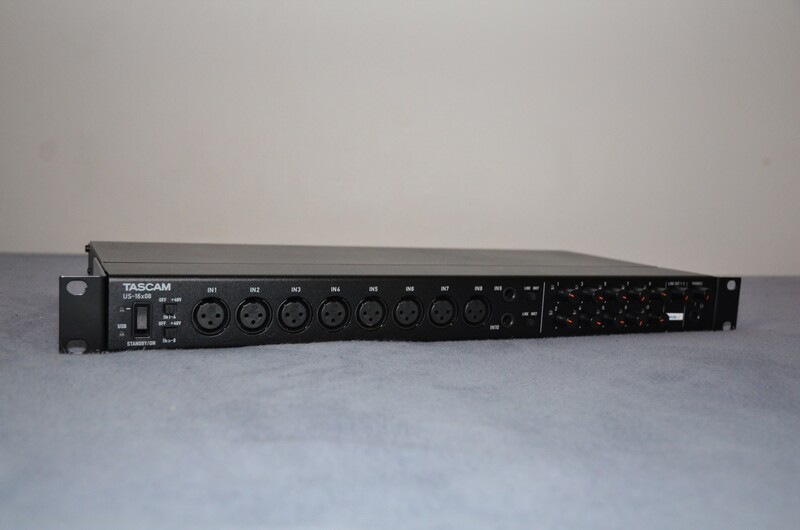 For more complex concert recordings or muti-channel studio recordings I have the US-16x08 from Tascam. 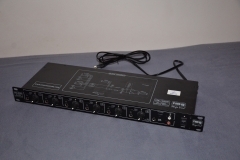 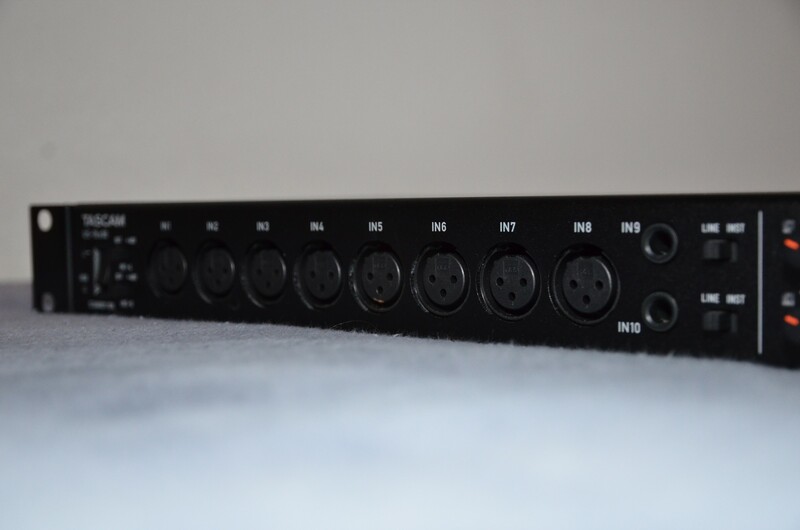 An audio interface with USB 2.0, 8 adjustable mic inputs with grouped phantom power, 8 line inputs (two of them adjustable) and 8 line outputs. 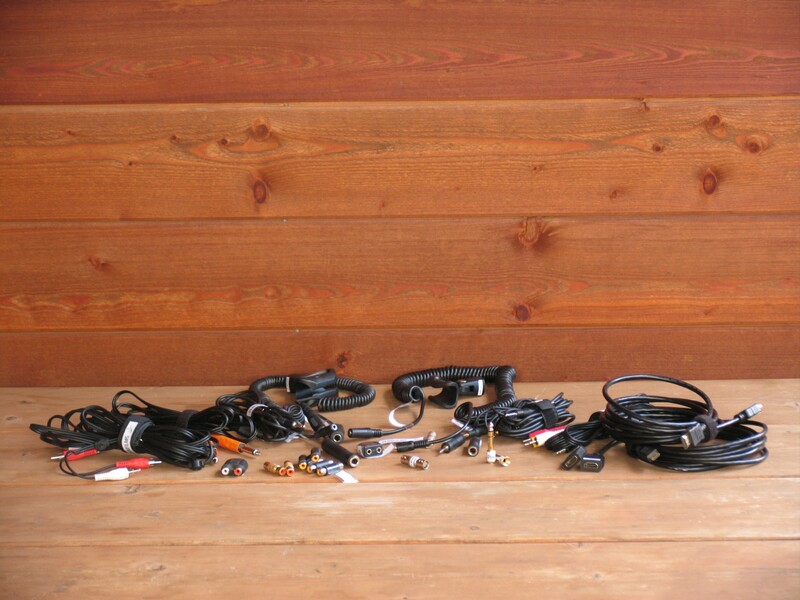 For the same studio and concert recordings you need, of course, some mics. 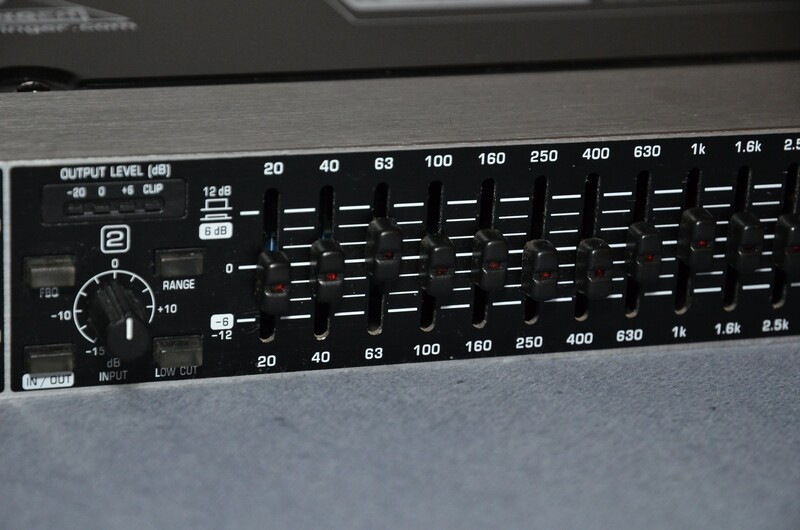 Until now I own two the t.bone EM722 small membrane condenser mics, which deliver a very good quality for a low price. 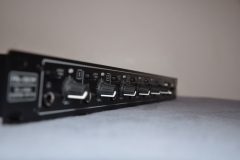 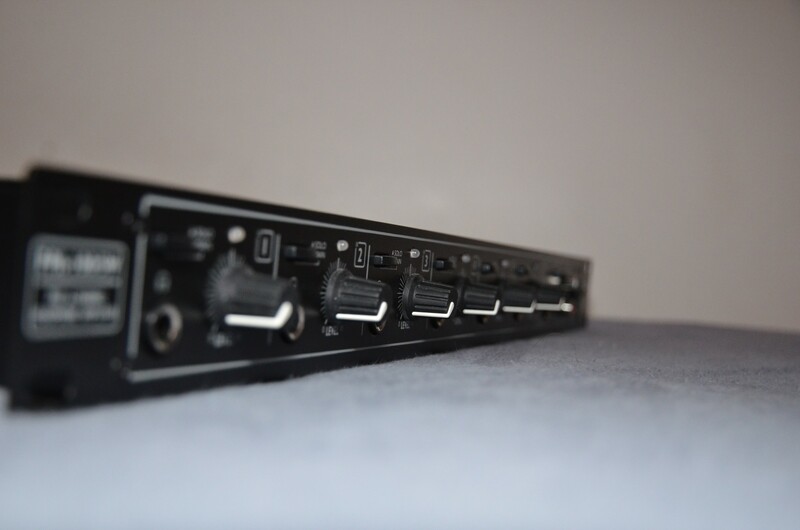 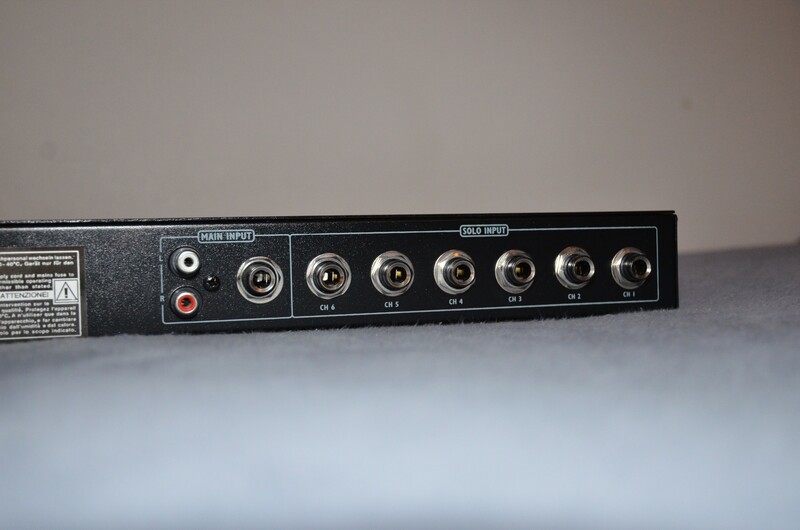 A 6-channel headphone amplifier from img StageLine, the PPA-100/SW. 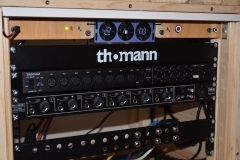 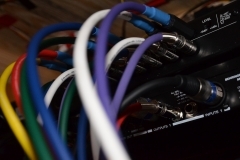 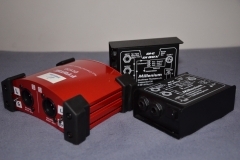 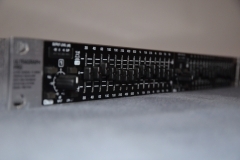 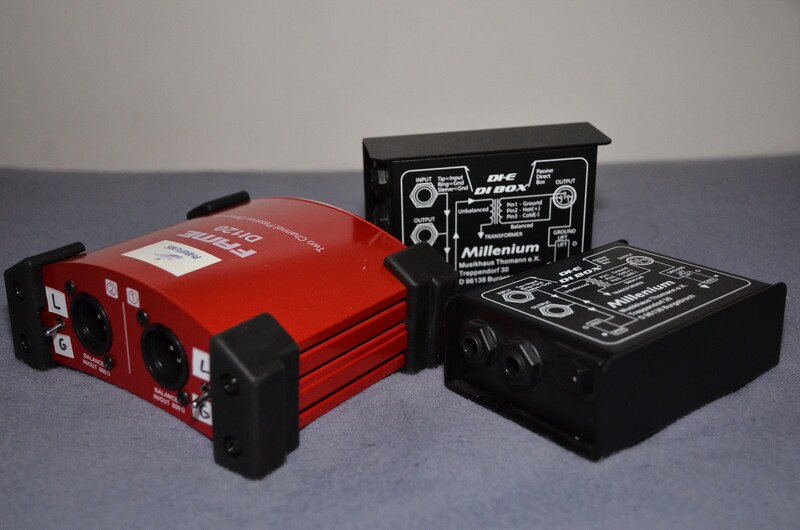 Individual loudnes control as well as switching between Main- and Solo-Input per channel. 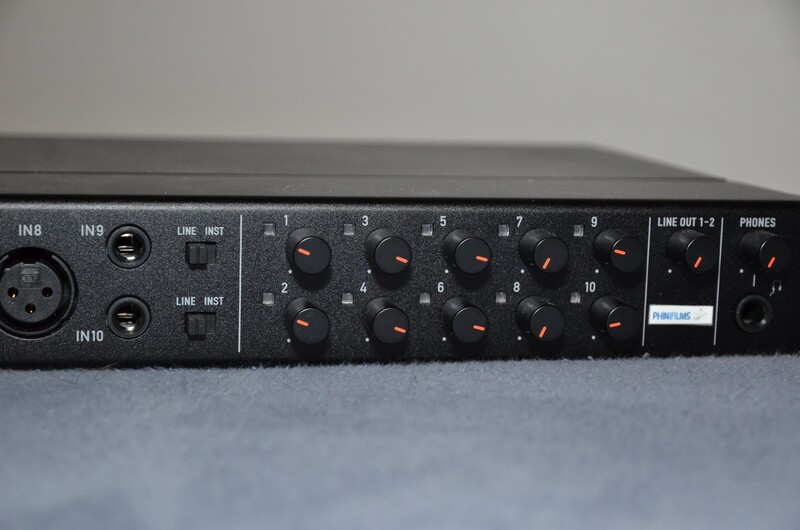 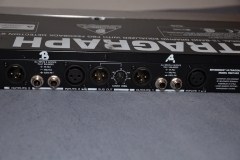 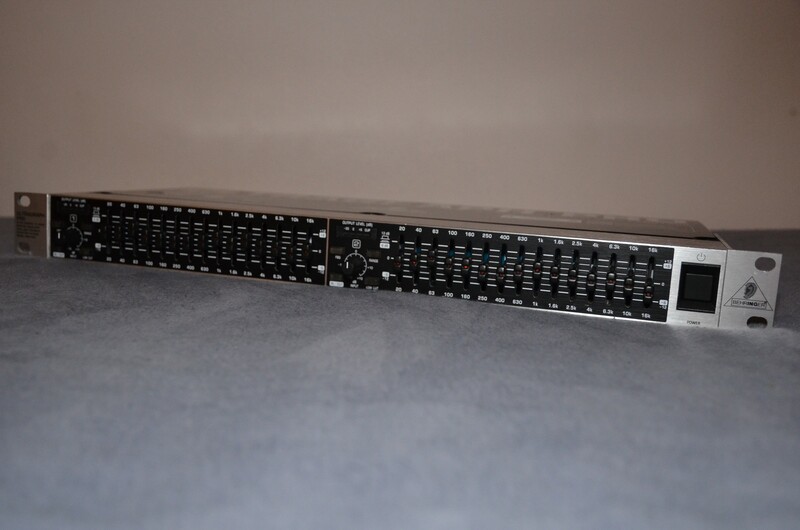 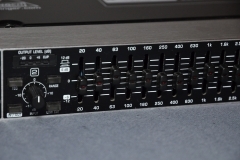 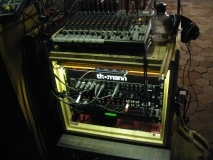 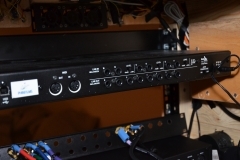 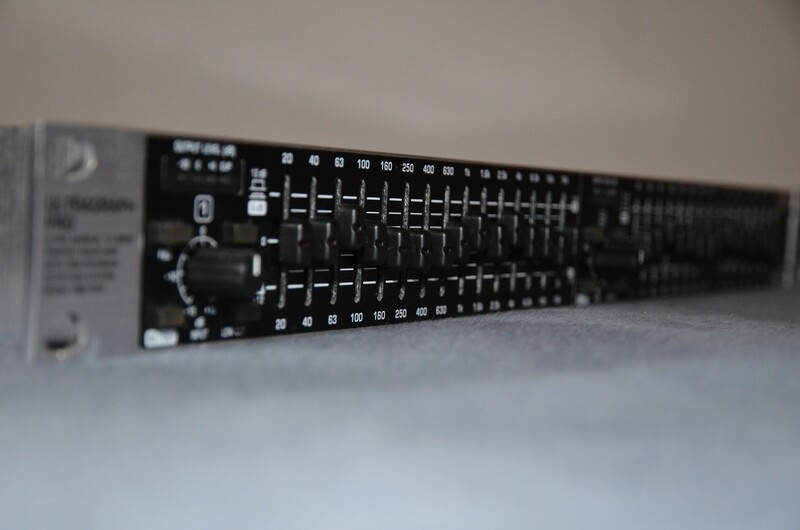 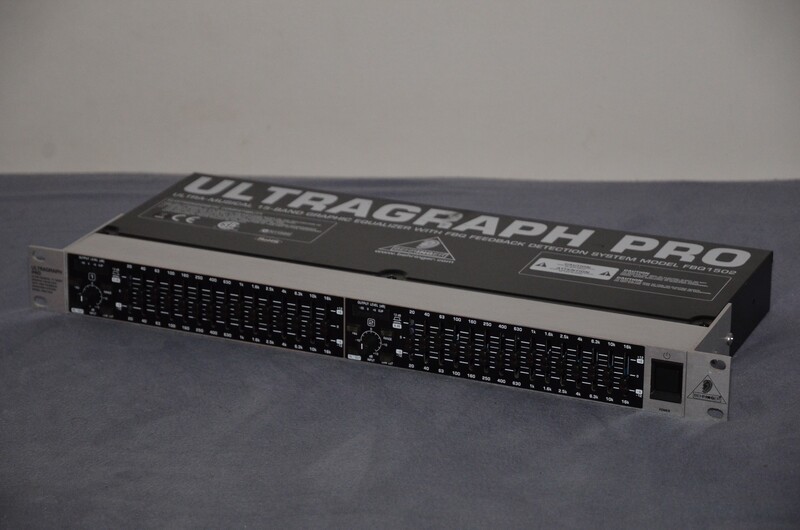 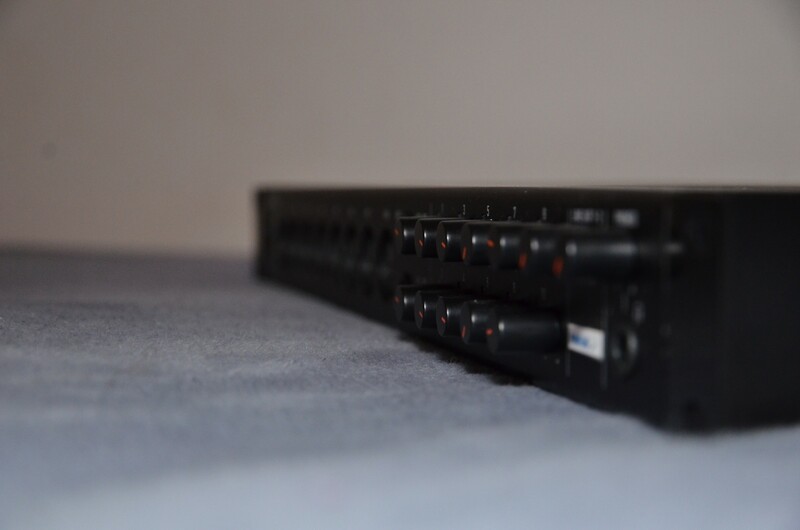 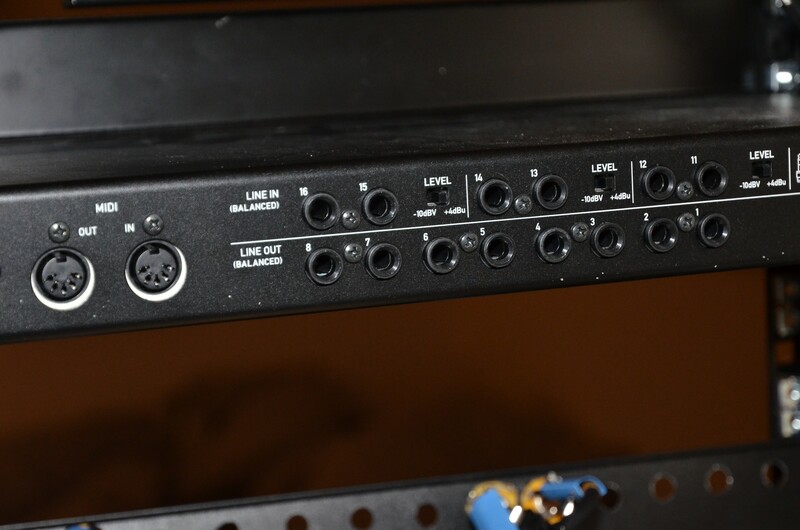 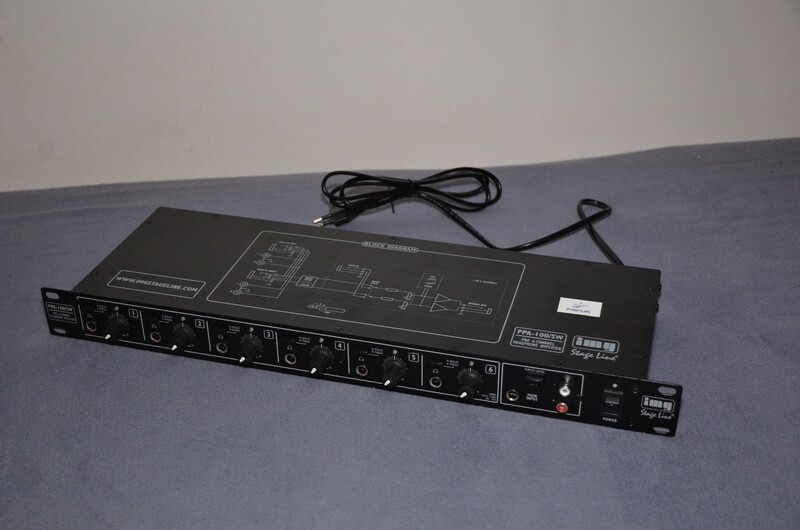 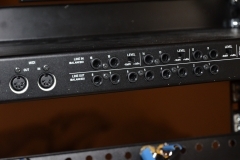 The Behringer Ultragraph Pro FBQ 1502, a graphic stereo equalizer, is used for adjusting the main-signal to the room sound. 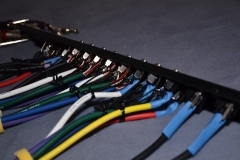 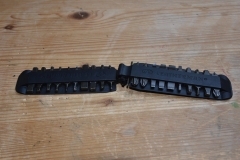 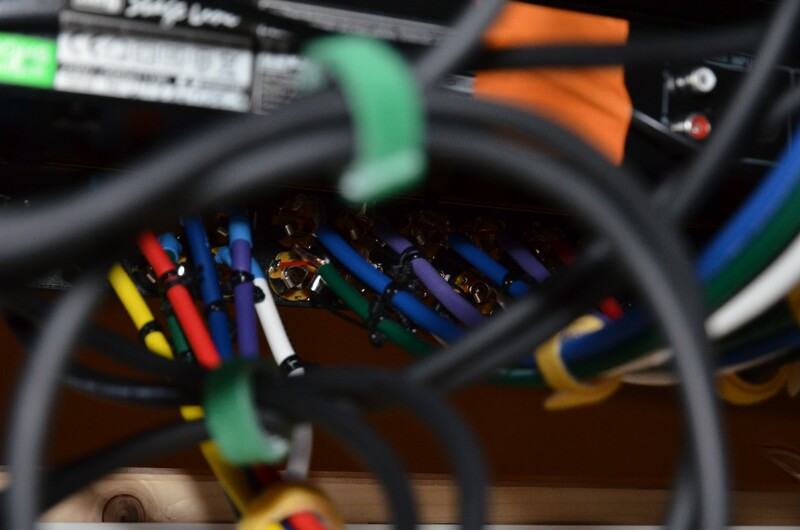 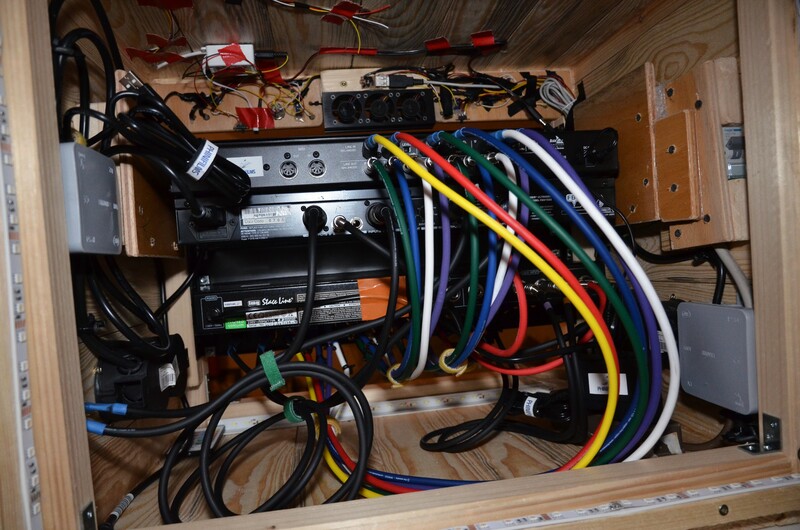 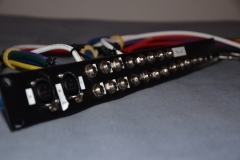 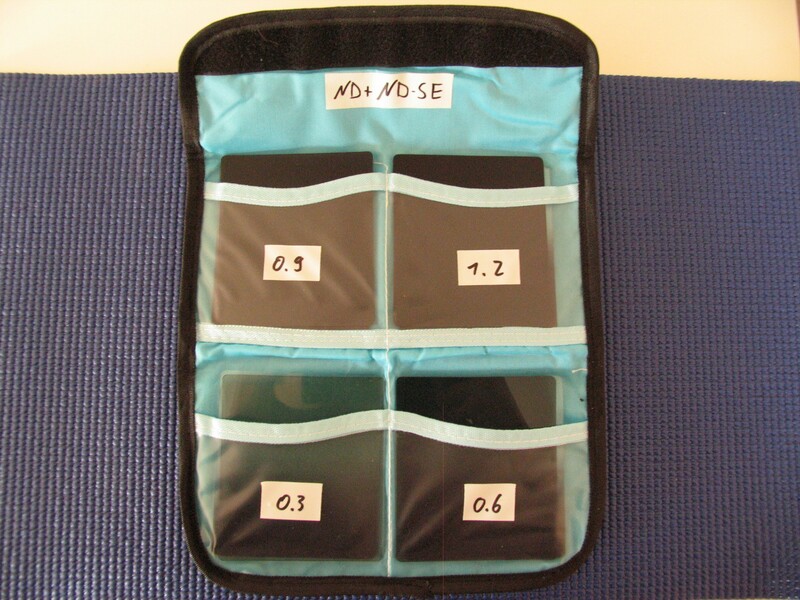 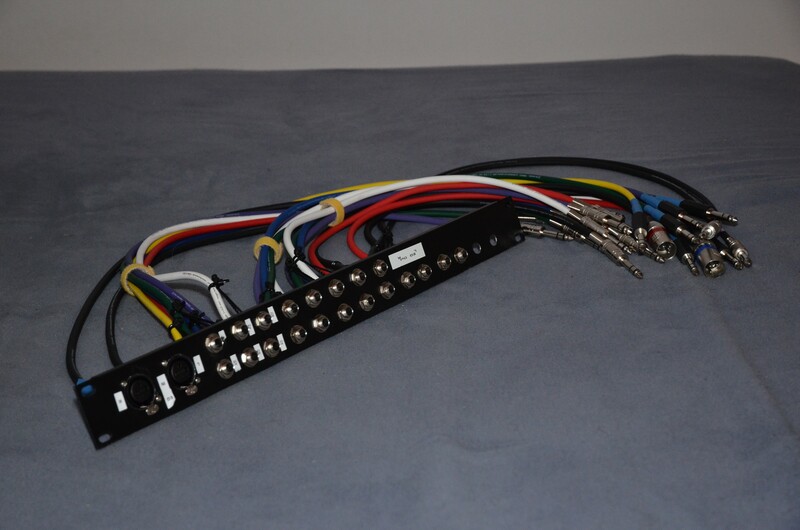 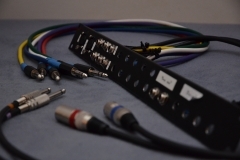 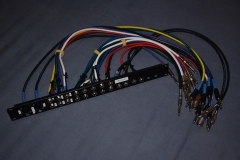 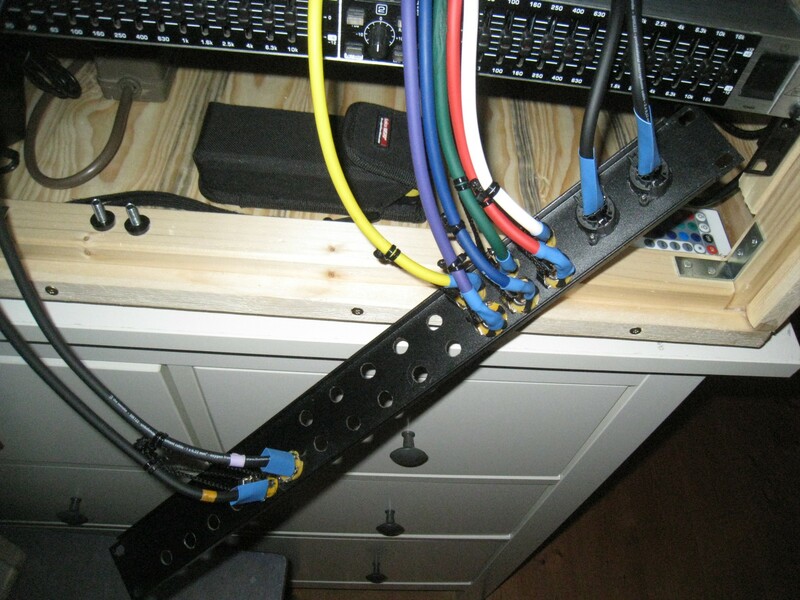 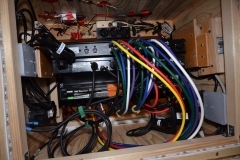 A self-made patch panel, to reach the rear inputs of the devices from the front. 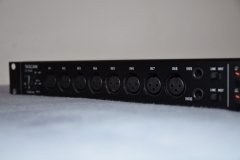 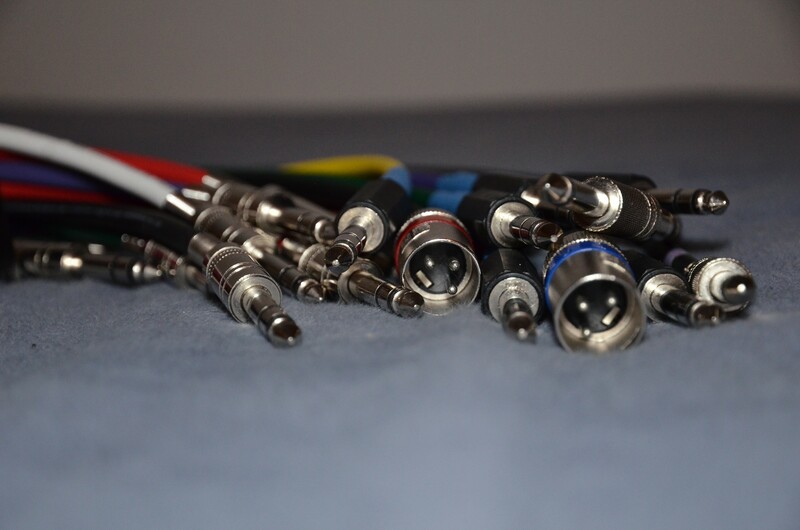 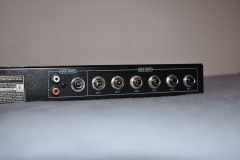 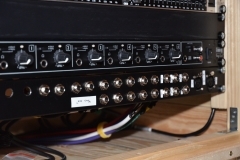 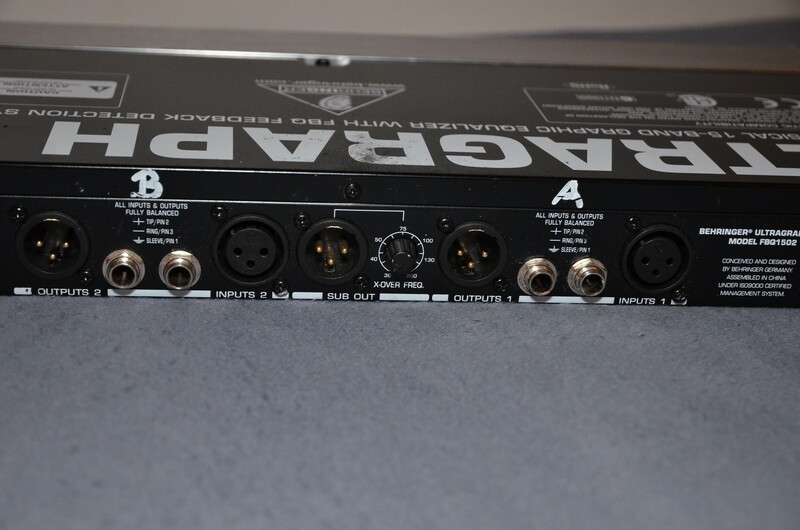 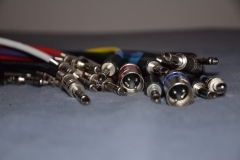 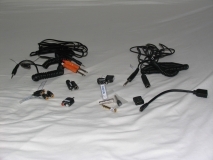 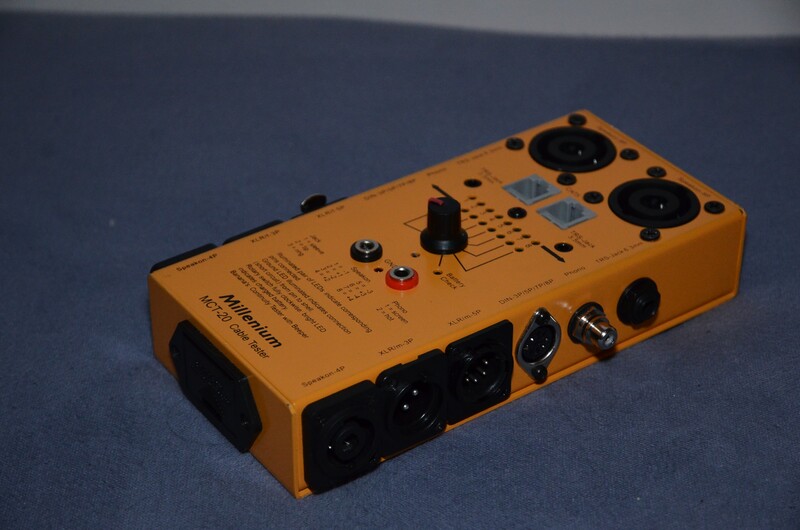 Apart from two XLR-Inputs for the Mixer output, it has holes for 22 TRS-Jacks.